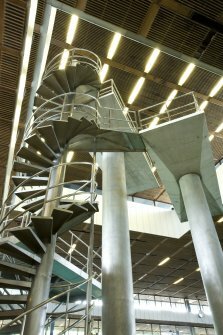 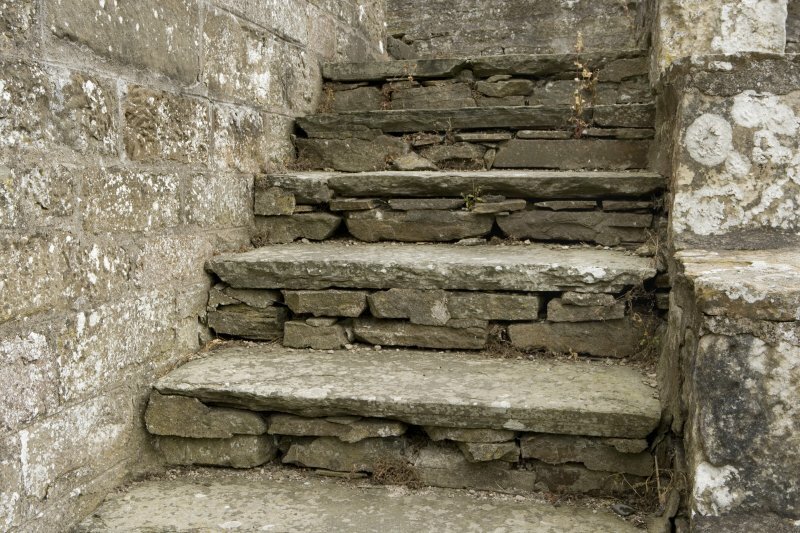 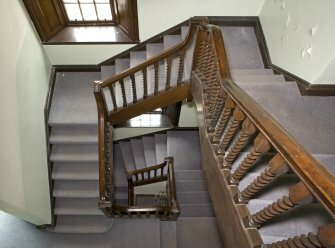 Stairs: "a set of steps built between two floors inside a building". 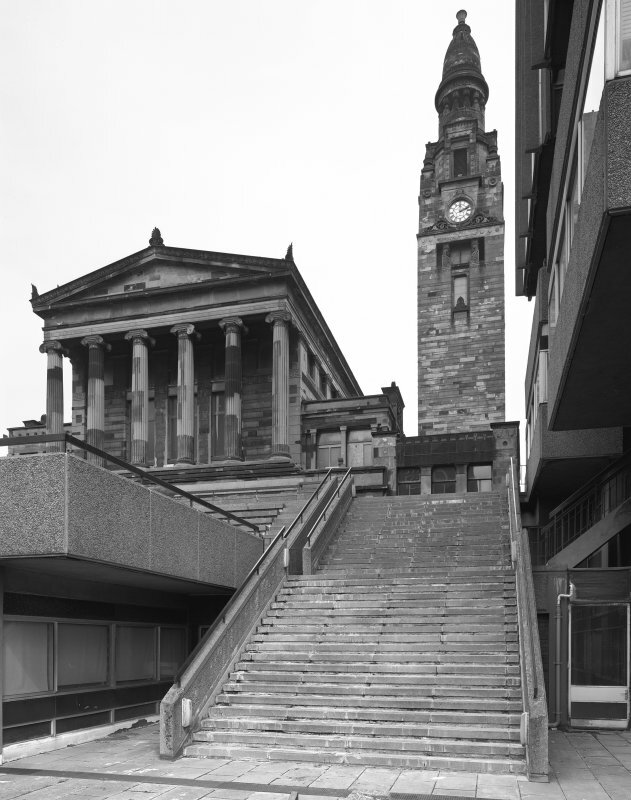 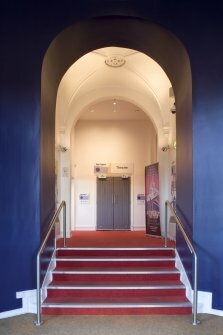 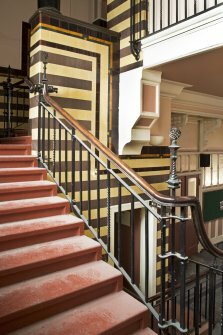 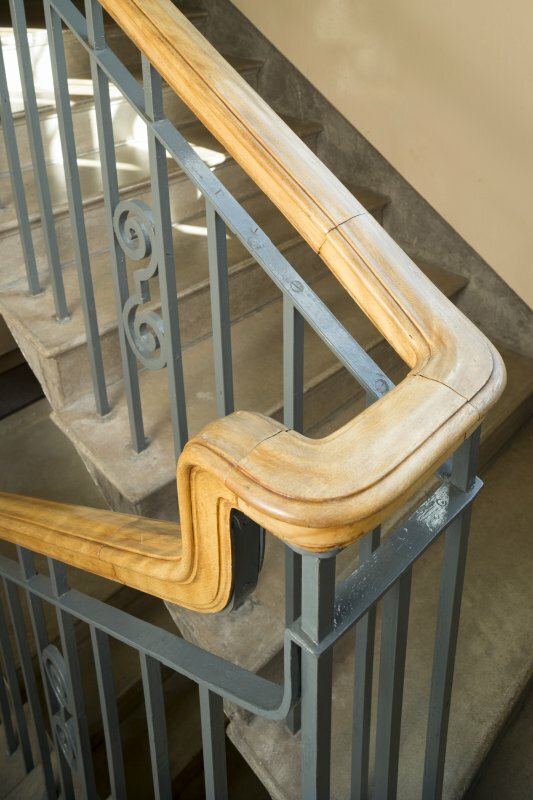 This is the first in a series of galleries showcasing architectural details, in this case highlighting images of stairs, staircases, steps and escalators from the collections of Historic Environment Scotland (HES) to celebrate the Year of Innovation, Architecture and Design 2016. 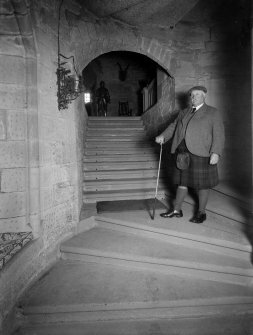 The HES collections include a wealth of material illustrating and recording interiors and exteriors of all types of buildings across Scotland. 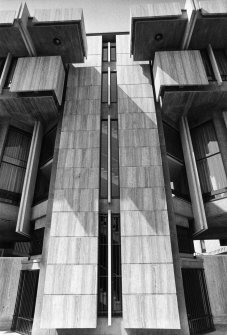 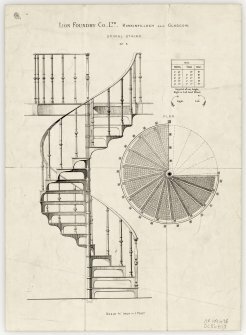 They include historic prints and drawings as well as survey photographs from the past hundred years which create a fascinating architectural record. The collections can be consulted in our Search Room and through a range of online resources. New images and information are added to Canmore every day through brand new surveys of Scotland's built heritage, as well as through an active digitisation programme of our unique negatives, prints and drawings. 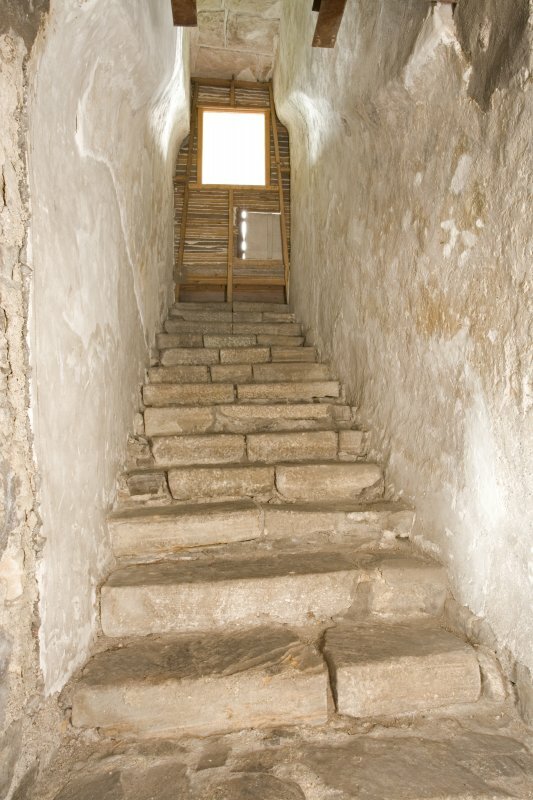 Interior view of Banff tollbooth steeple staircase, vertical view from above. 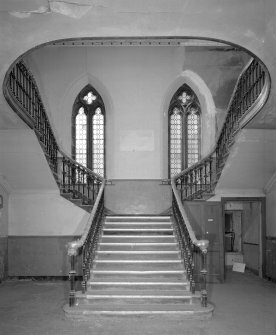 Interior view of Rothesay town hall and sheriff court staircase, ground floor, view from south. 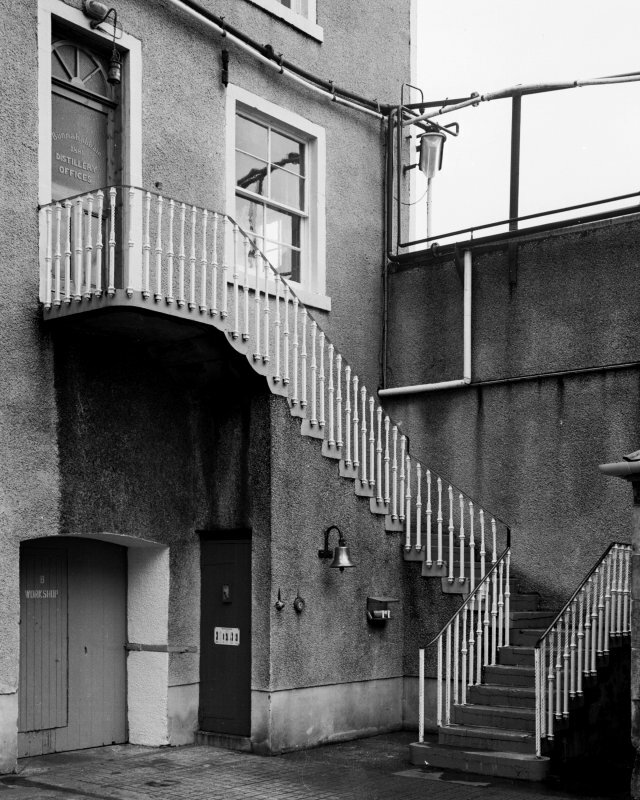 View of external stair to Bunnahabhainn distillery offices, Islay. 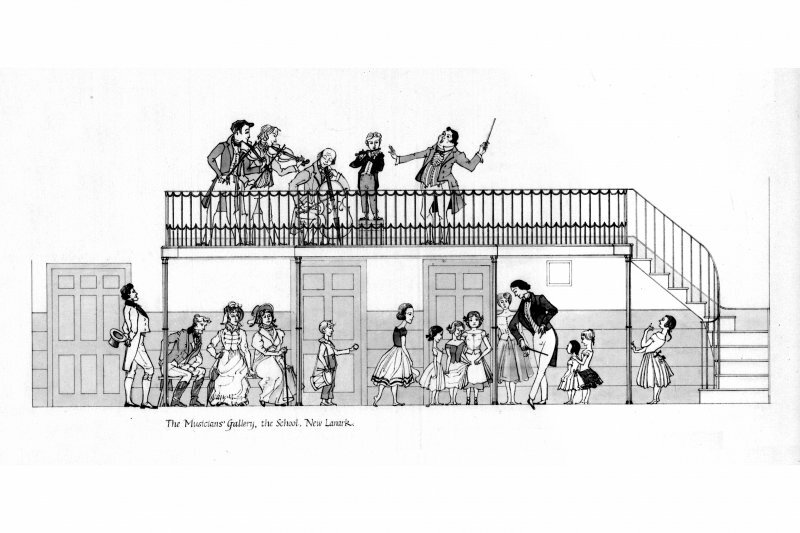 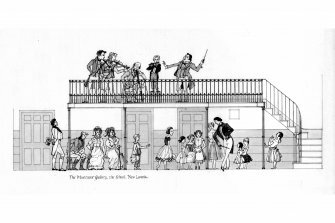 Drawing of 'The Musicians' Gallery, the School, New Lanark'. 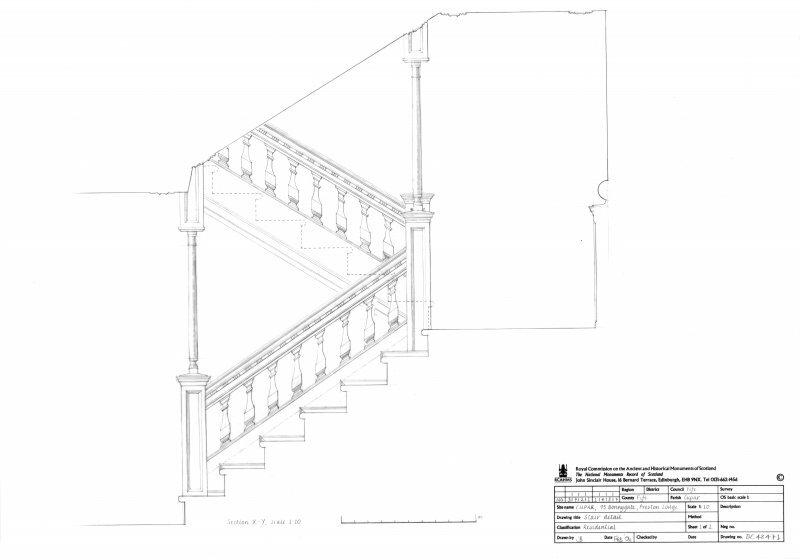 Half plan of gallery and stair with period characters. Titled: 'The Musician's Gallery, the School, New Lanark' 'Half-plan of gallery and stair' 'section' 'plan detail' 'section of building'. 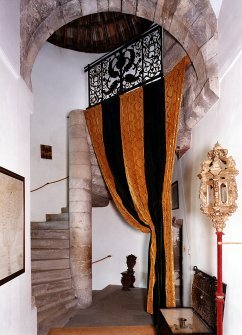 Interior view of Falkland Palace 1st floor turret staircase and velvet panel, from west. 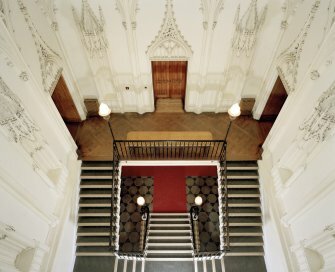 Main staircase hall of Taymouth Castle, Perthshire, view looking up from 1st floor landing to the north. 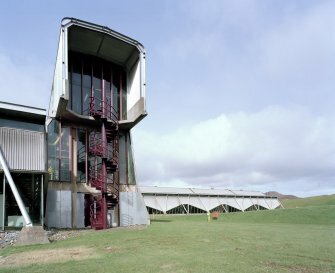 View of cantilever stair on south tower at Old Malt barn, Lagavulin Distillery, Islay. View looking SSW up central staircase at Gleneagles Station. 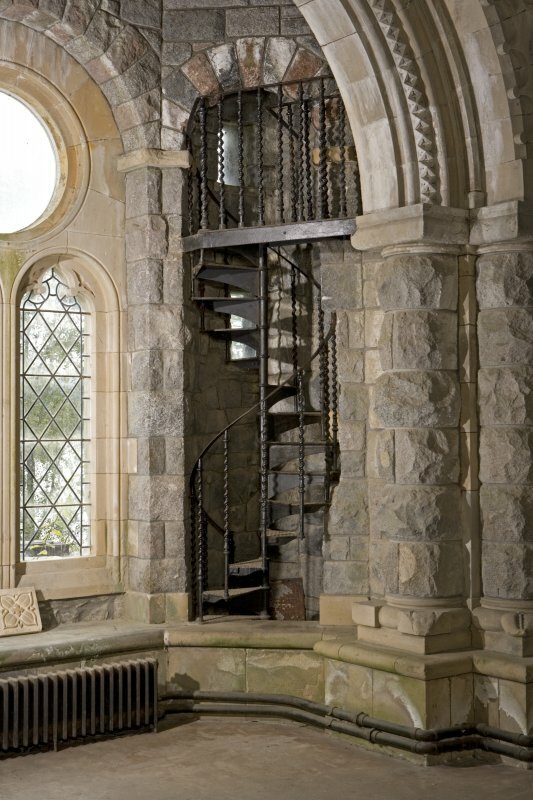 View of staircase at Kilmory Castle, Argyll, from north-west. 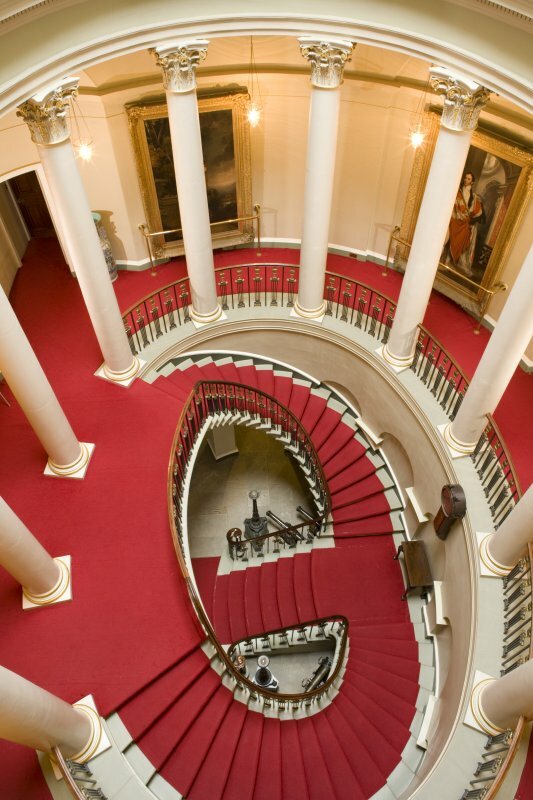 View of main staircase on half landing at the National Library of Scotland, Edinburgh, from South East. 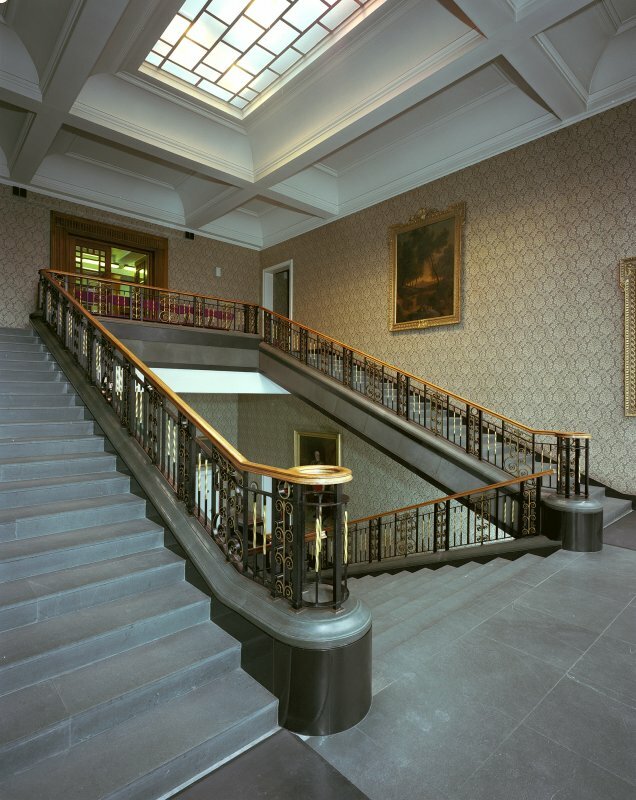 View of main staircase on ground floor at the National Library of Scotland, Edinburgh, from West. 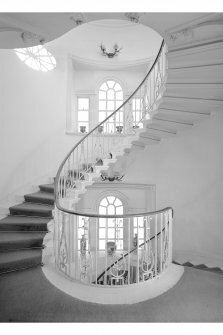 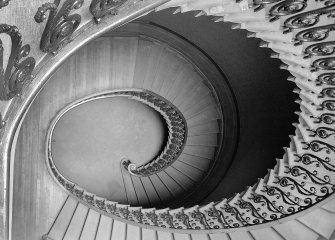 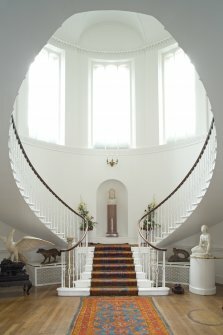 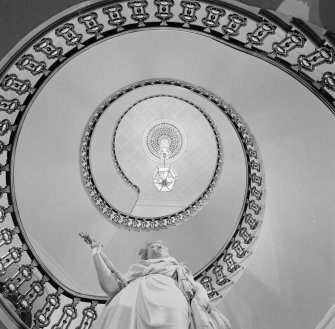 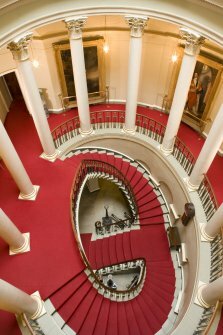 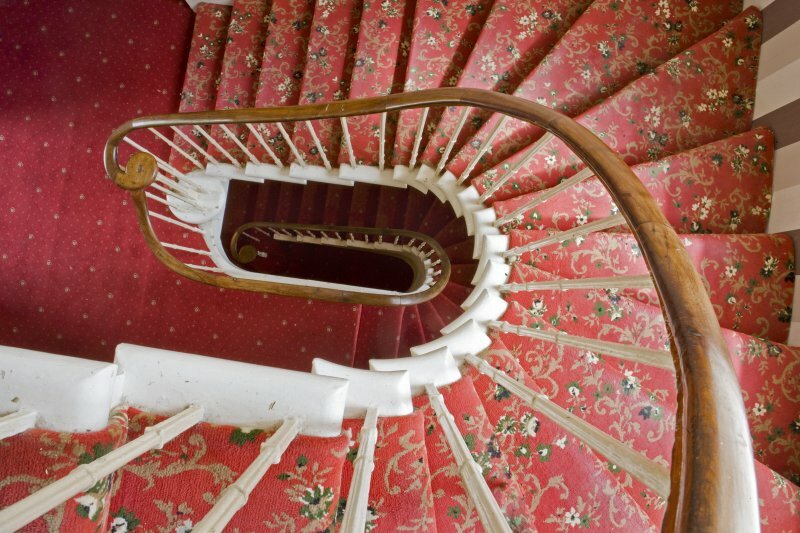 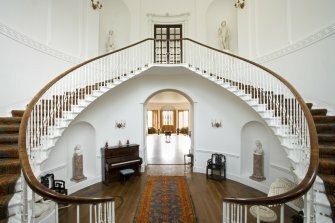 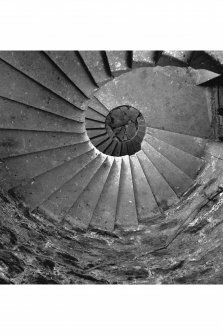 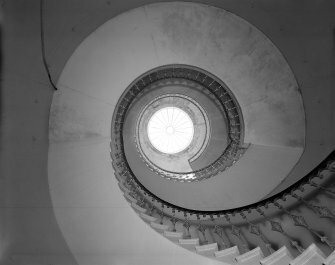 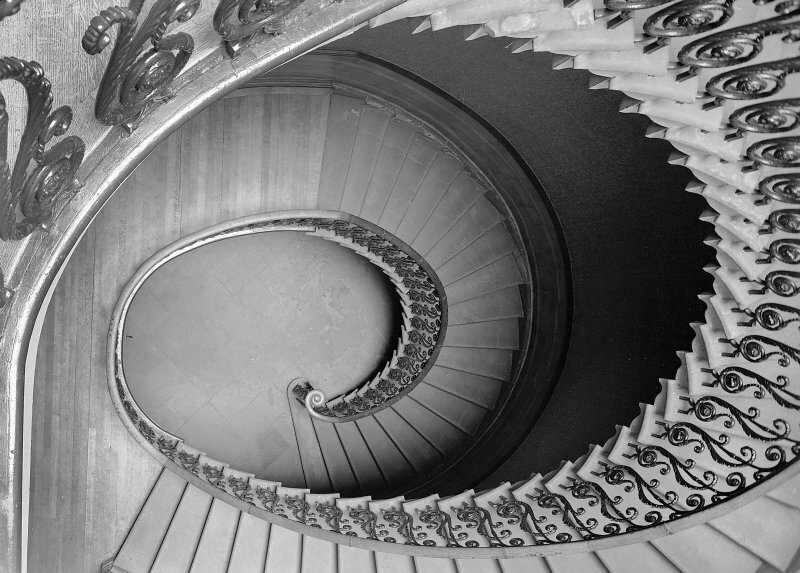 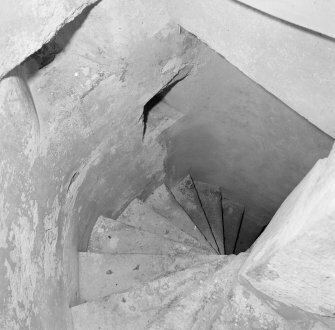 Spiral servants' staircase, view looking down centre of spiral in Paxton House, Berwickshire. Interior view of first floor staircase, 25 Blythswood Square, Glasgow. 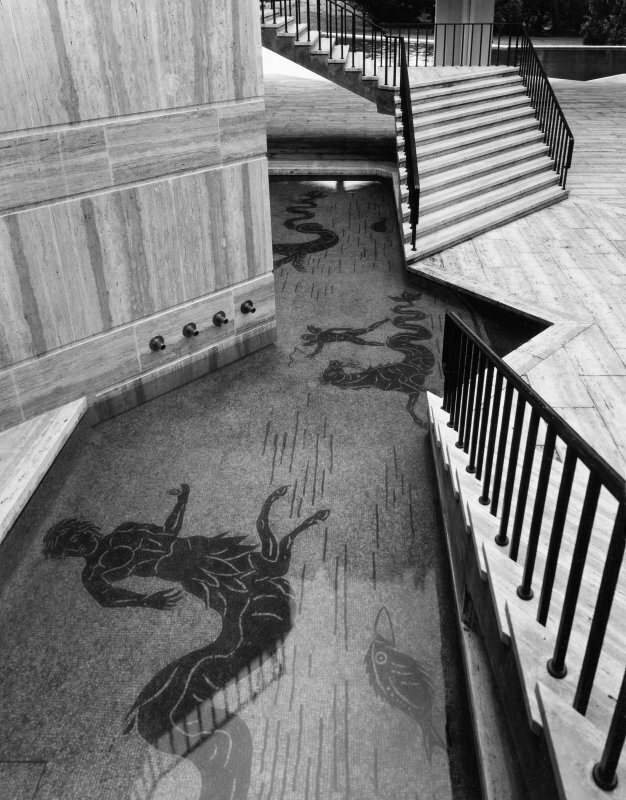 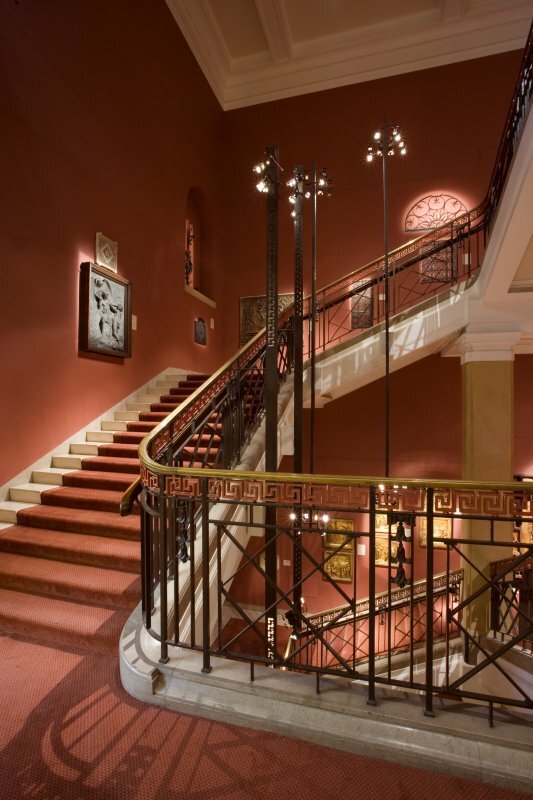 Interior view of the main stair at the Royal Museum of Scotland, Edinburgh, prior to modern renovation and alterations. Interior view of the spiral stair in the basement of the Royal Museum of Scotland, Edinburgh. 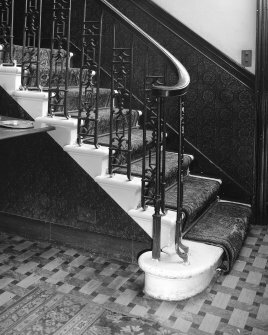 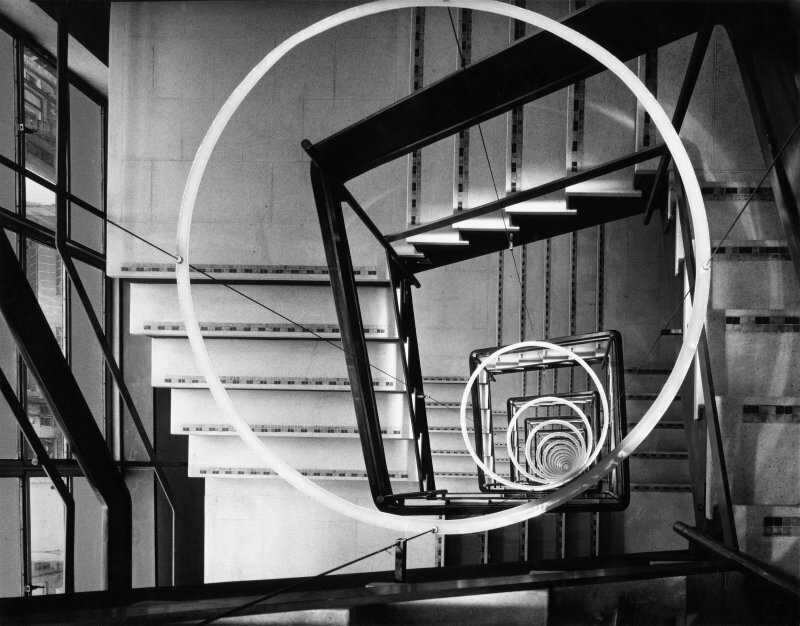 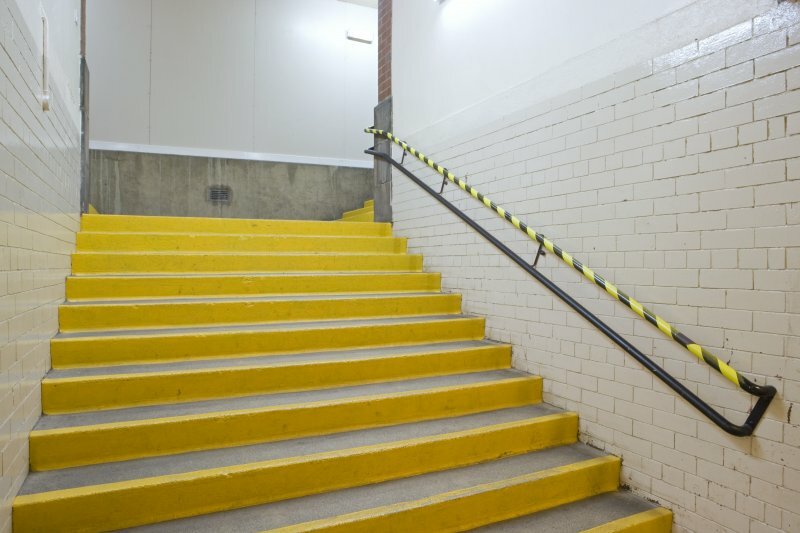 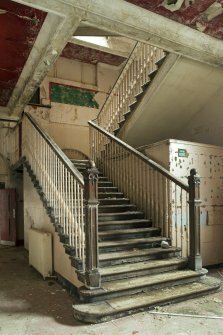 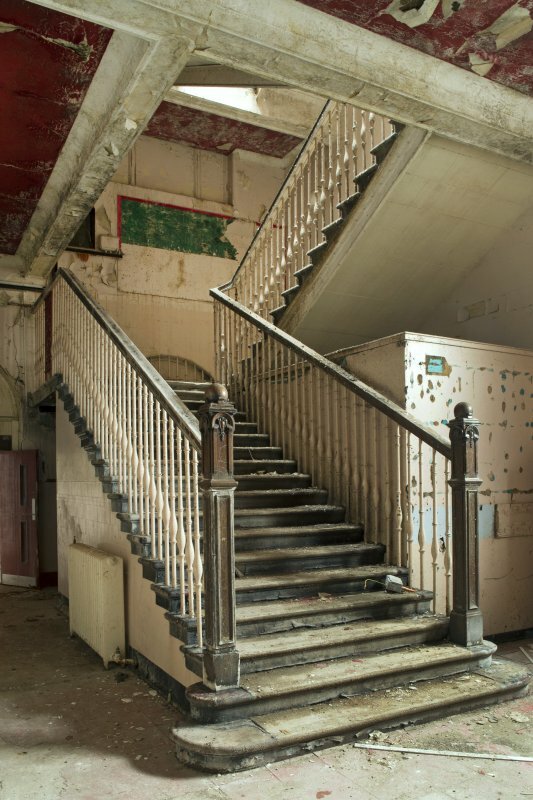 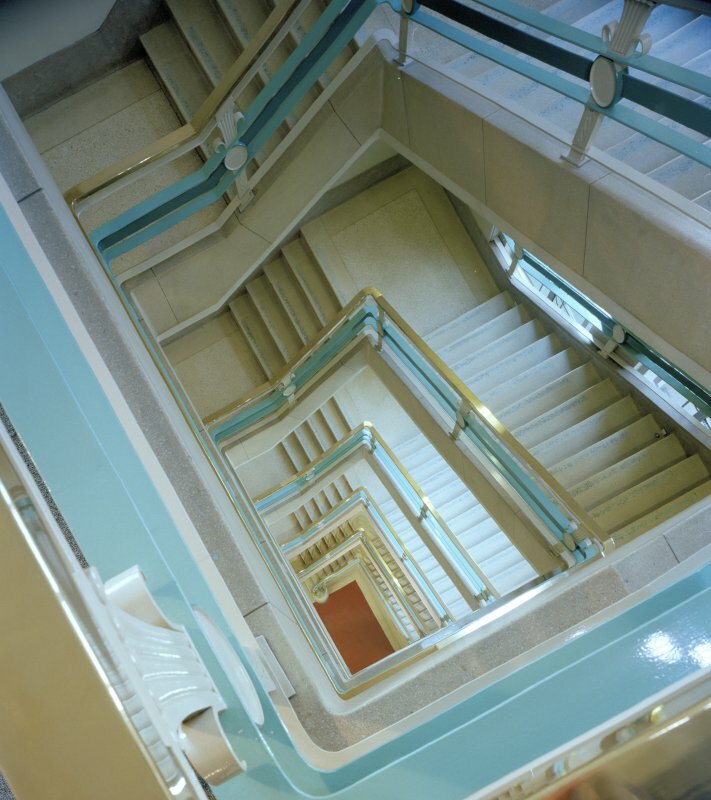 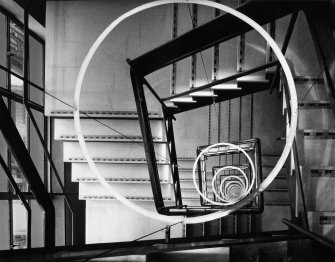 Interior view of stairs at Thorn House, headquarters of Thorn Electrical Industries, Camden, London. 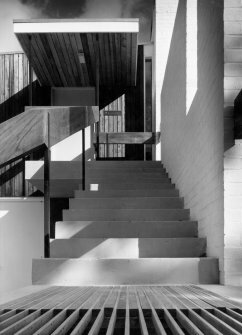 External view of concrete steps and entrance door at Beaulieu, Hampshire, the holiday home of Sir Basil Spence. 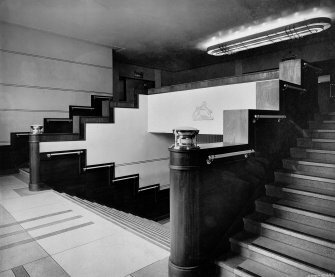 External view of the observation deck staircase at Glasgow Airport. 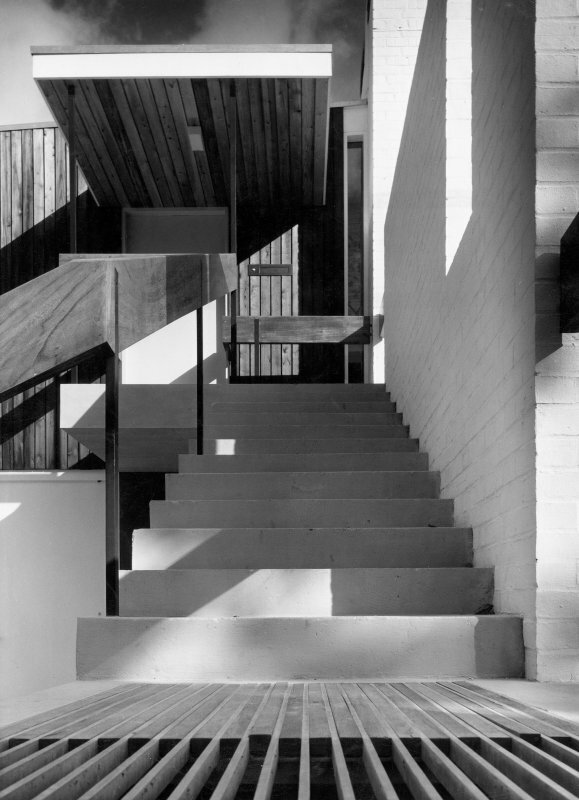 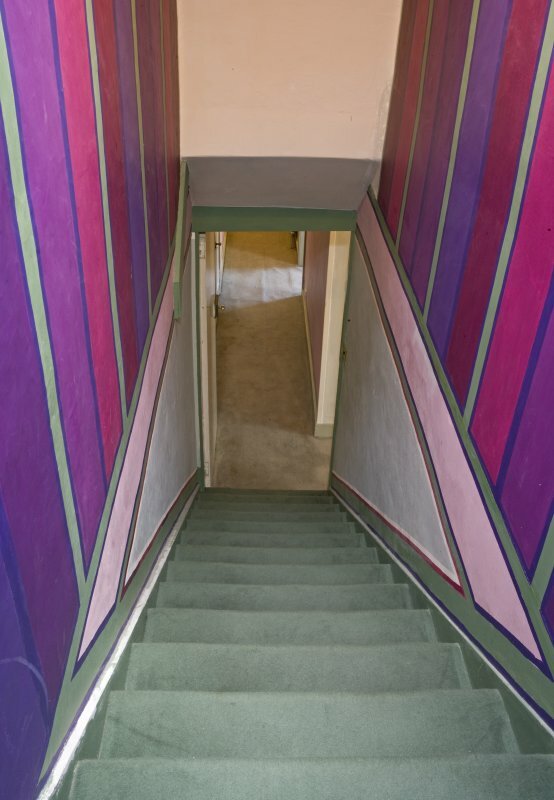 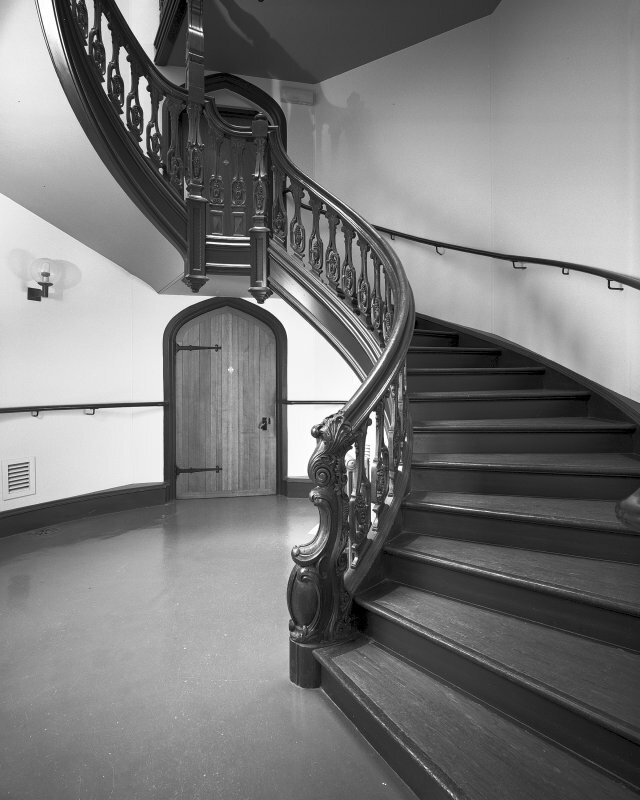 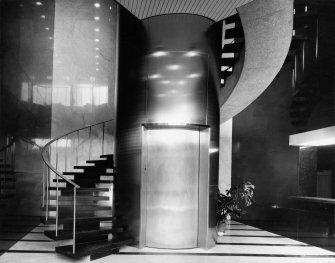 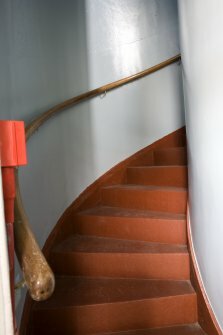 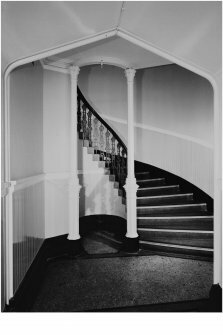 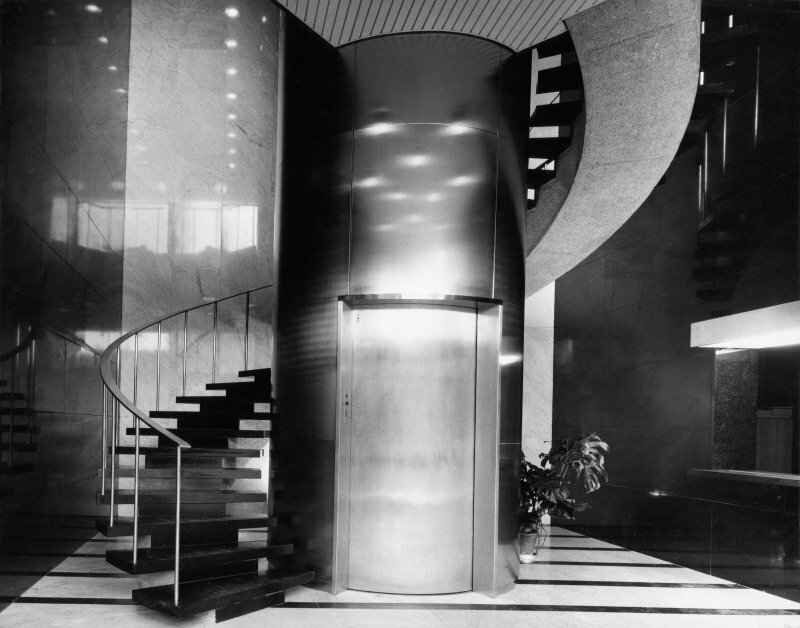 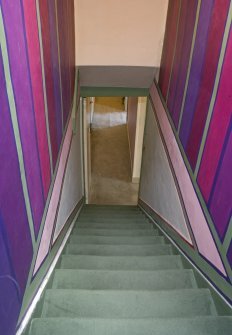 Interior view of the ground floor staircase at Gribloch House. 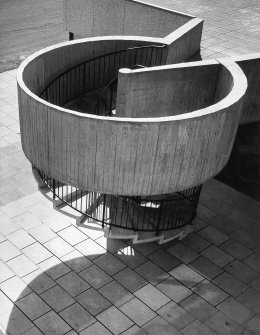 External view of the ceremonial stair in the courtyard of the British Embassy, Rome. 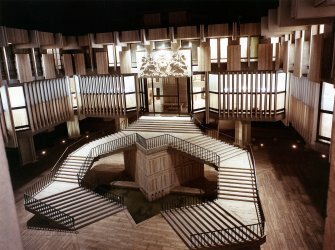 External view of the ceremonial stair at night, British Embassy, Rome. 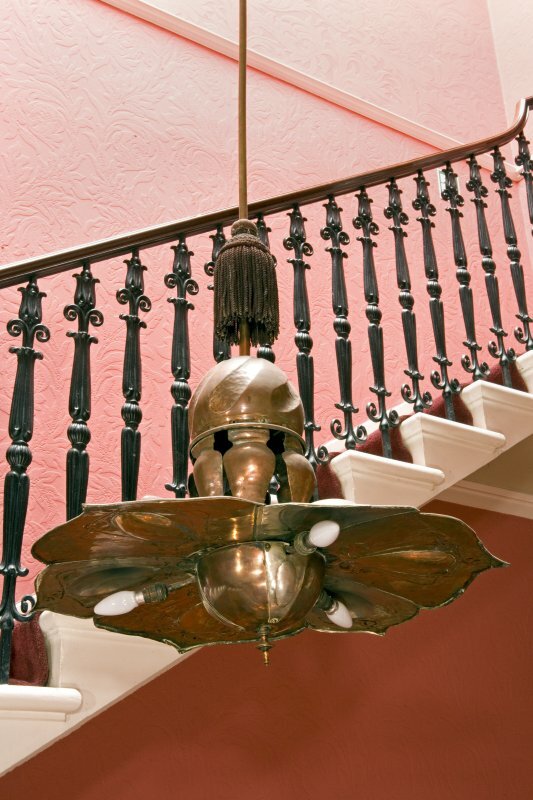 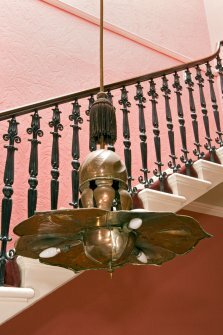 Interior view of the staircase and copper lamp at the Glasgow Art Club, 185 Bath Street, Glasgow. 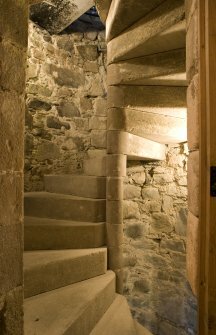 Interior view of stone staircase, Castle Stalker, Argyll. 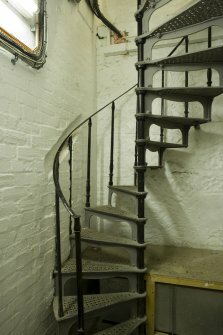 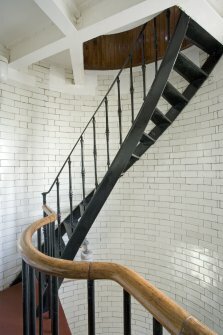 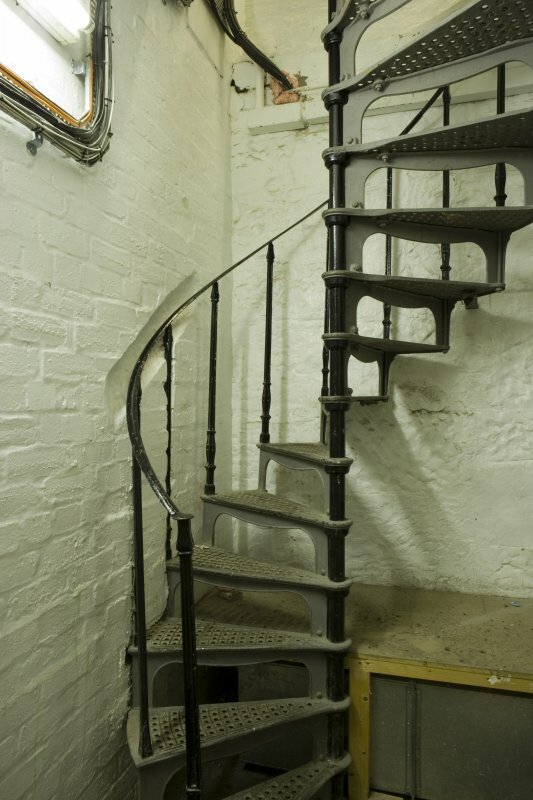 Interior view of the cast iron stair from 2nd level to lightroom, Todhead Lighthouse. 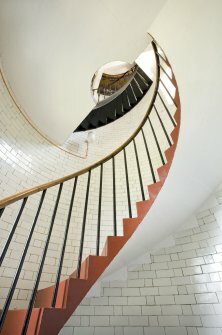 Interior view of the cantilevered stone stair in Todhead Lighthouse looking up to the lightroom. 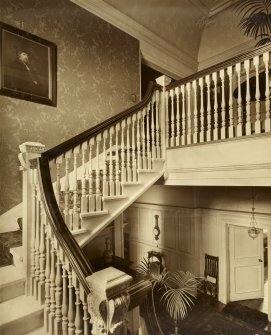 Interior view of back stair, Kinnaird House. 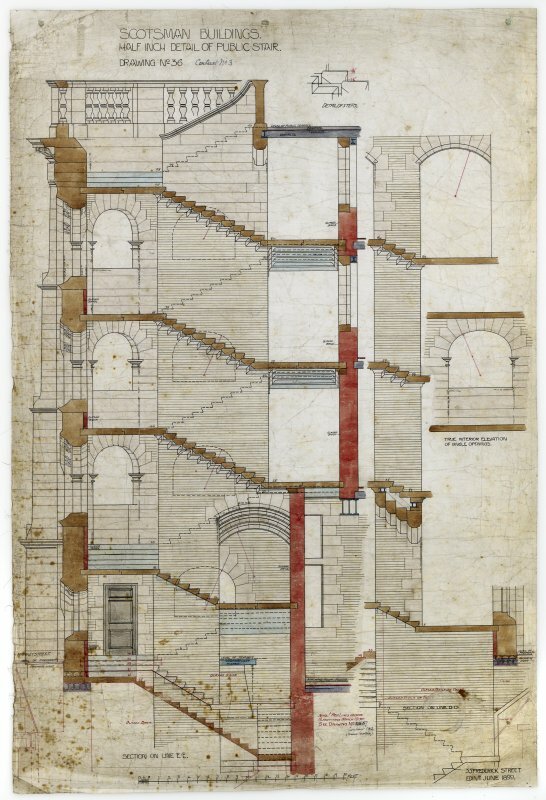 External view of stairwell on the NE elevation, British Embassy, Rome. 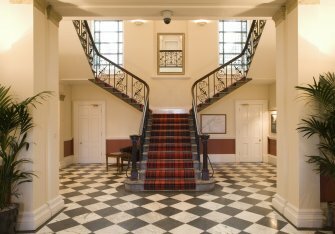 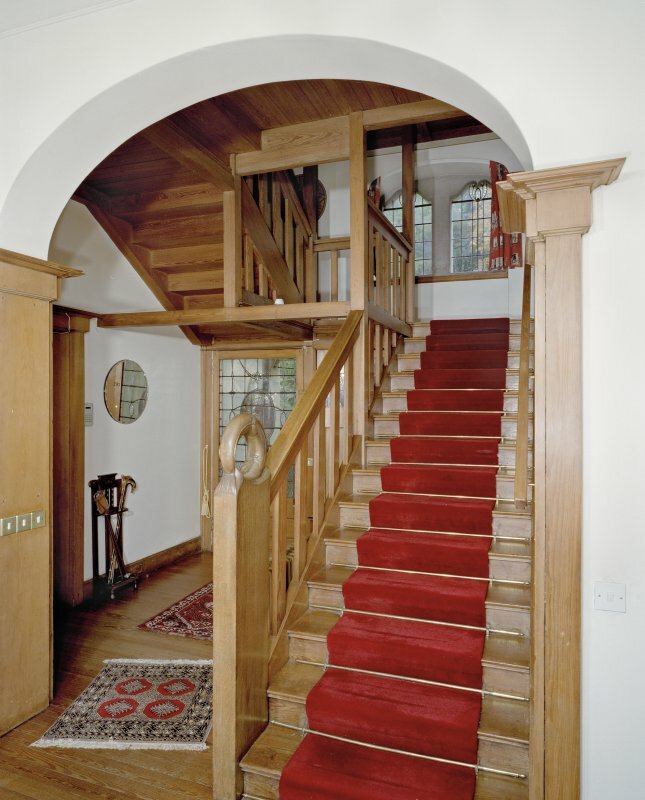 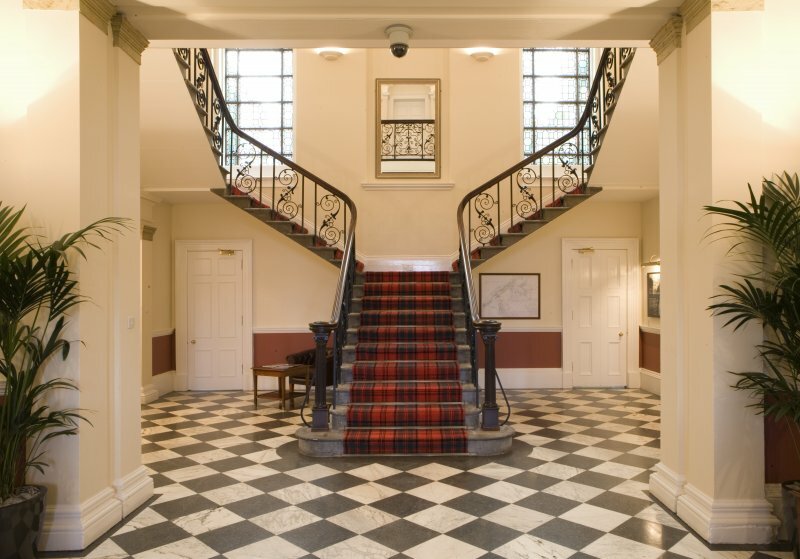 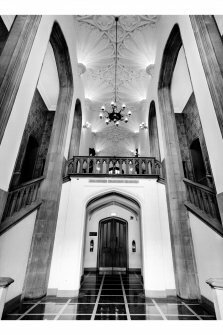 Internal view of the ground floor entrance hall and staircase, Aberlour House, Moray. 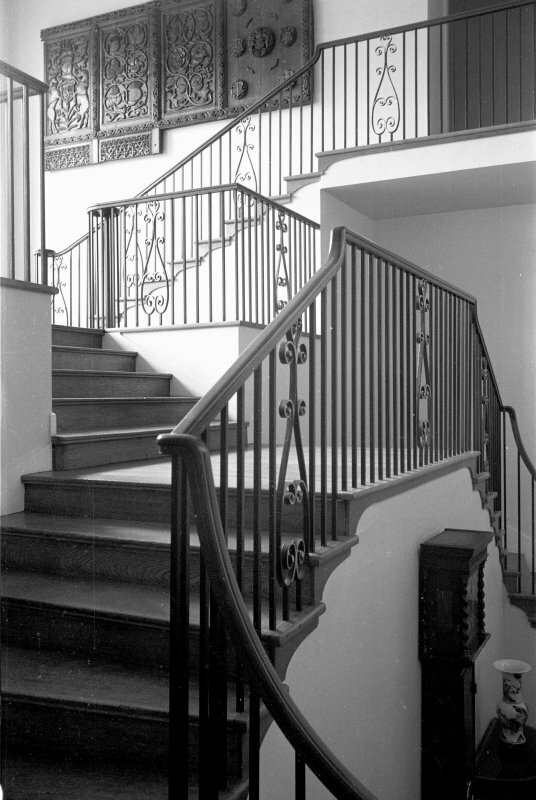 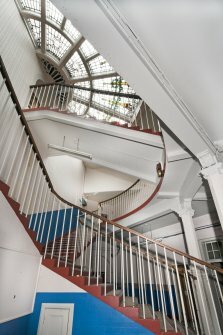 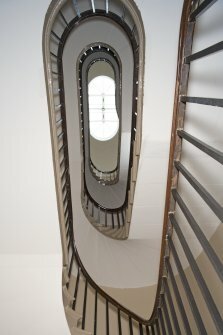 Interior view of the ground floor main stairwell, Fasque House. 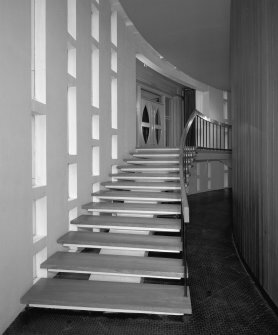 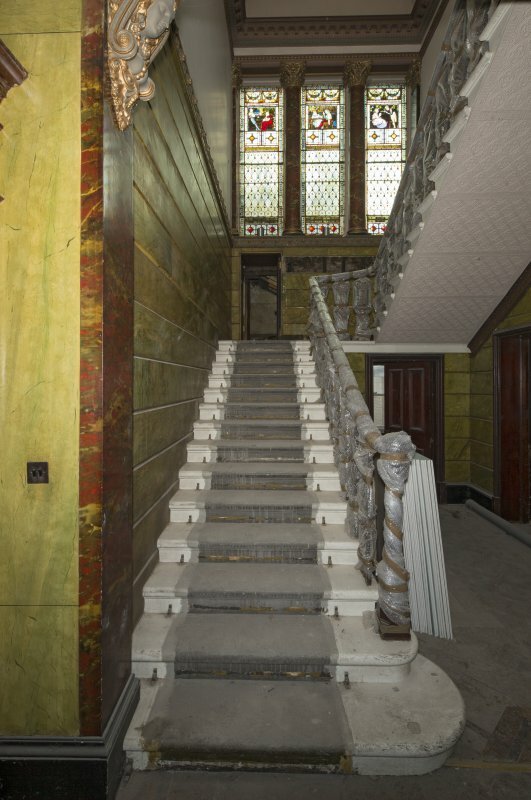 Interior view of stairwell from the lower landing to main entrance hall, Fasque House. 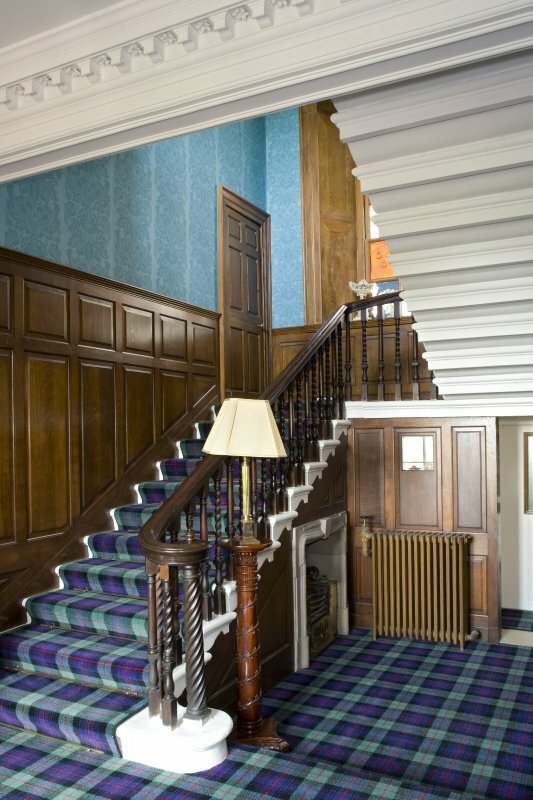 Interior view of the ground floor stair hall, Kilmacolm, Rowantreehill. 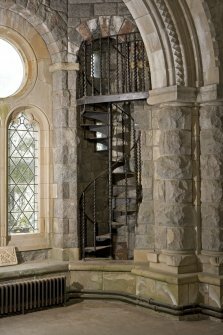 Interior view of the south aisle spiral stair at St Conan's Church, Lochawe. 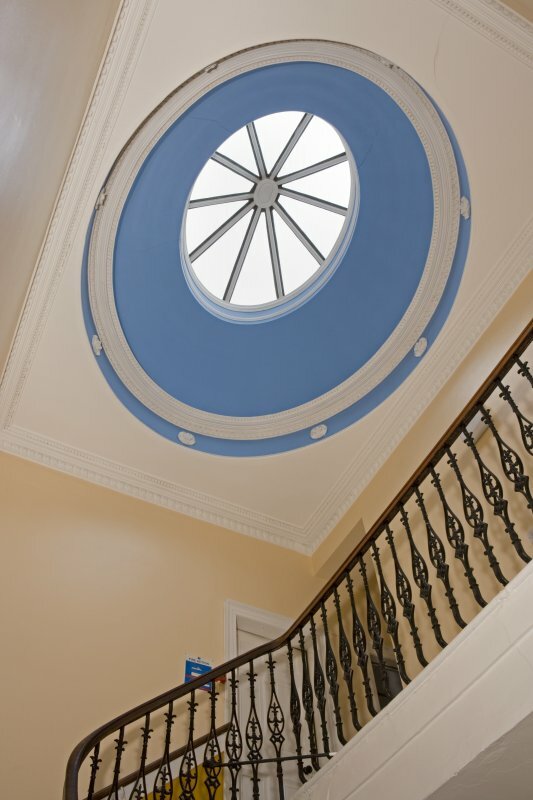 Interior view of stairwell and cupola at No 31 Melville Street, Edinburgh. 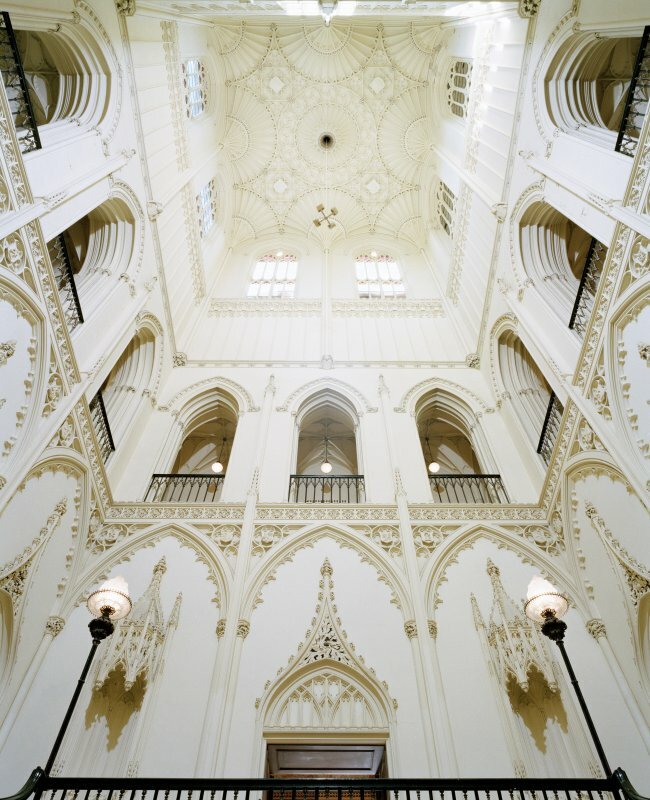 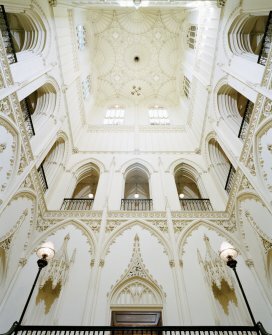 Interior view of main staircase at Taymouth Castle. 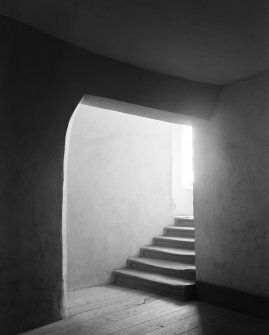 Interior view of stair to crypt at Glamis castle. Interior view of mural stair, portcullis gate, Cassillis House. 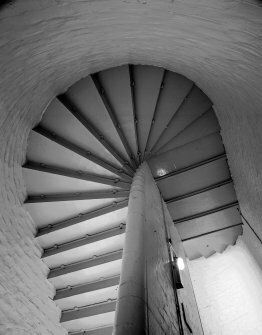 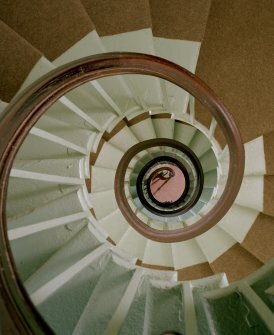 Interior view of the circular stair tower at Cape Wrath lighthouse. 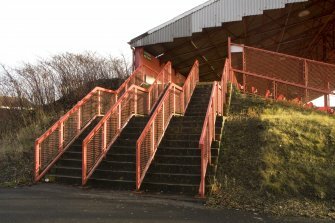 Exterior view of west stairs leading to the North Bank enclosure at St Mirren Park football stadium. 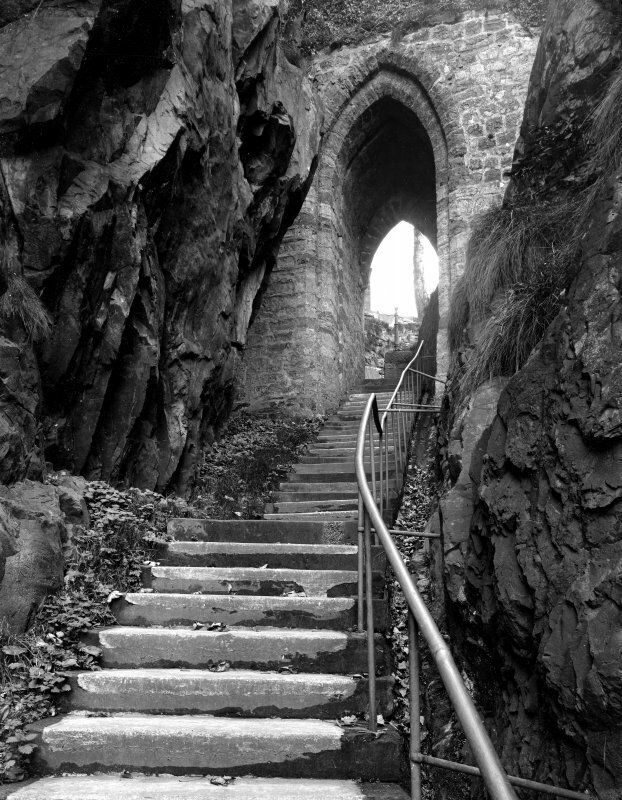 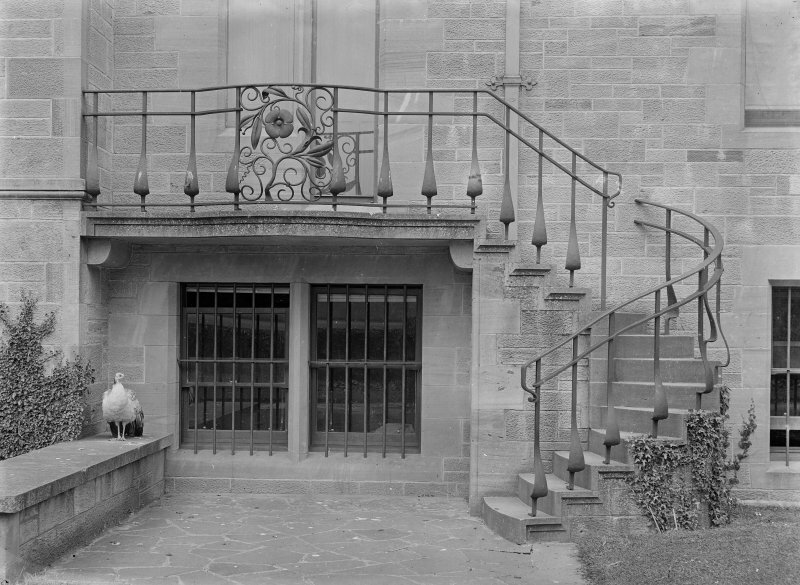 Exterior view of Chapter-house stairs to dormitory at Balmerino Abbey. Drawing of stair detail at Preston Lodge, Cupar. 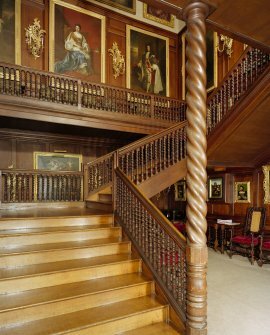 Interior view of 1st floor oval staircase at Culzean Castle. 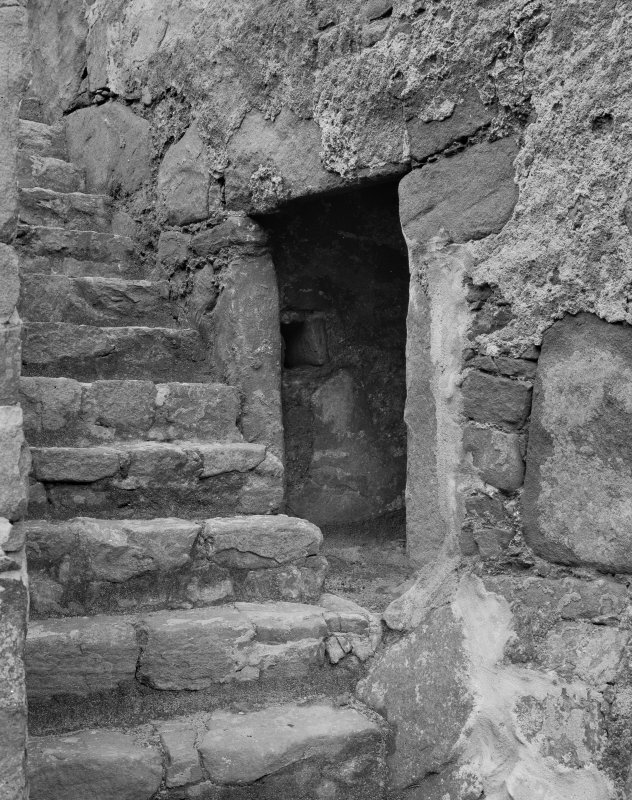 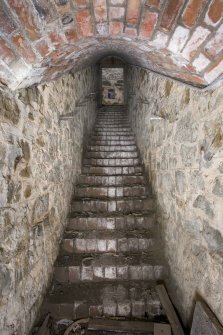 Interior view of stairs leading to south blockhouse of Fort No. 3, Inchkeith, Firth of Forth. 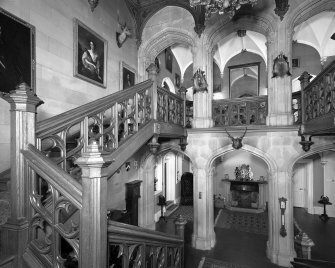 Interior view looking up the servant's stair at Culzean Castle. 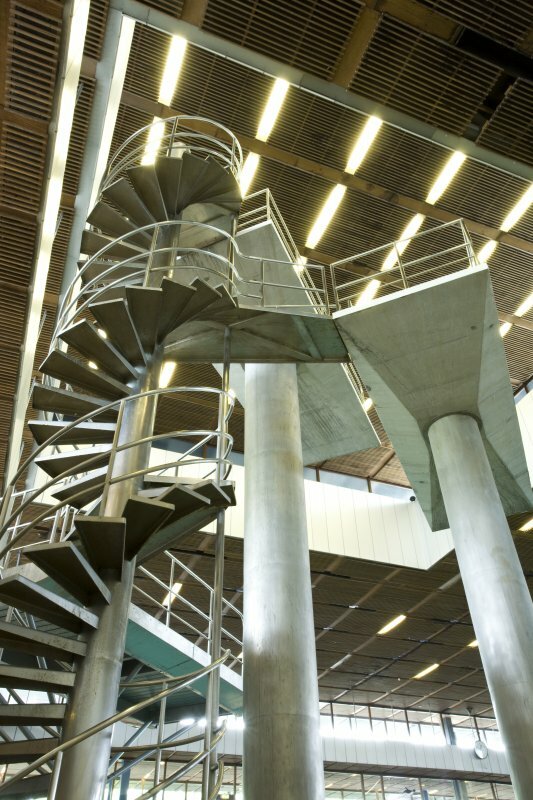 Interior view looking up to main diving platforms and spiral access stair at the Royal Commonwealth Pool, Edinburgh. 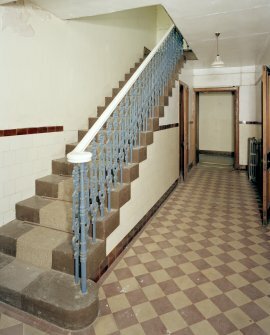 Interior view of stairwell at Dundee Central Corps Salvation Army Hall, Dundee. 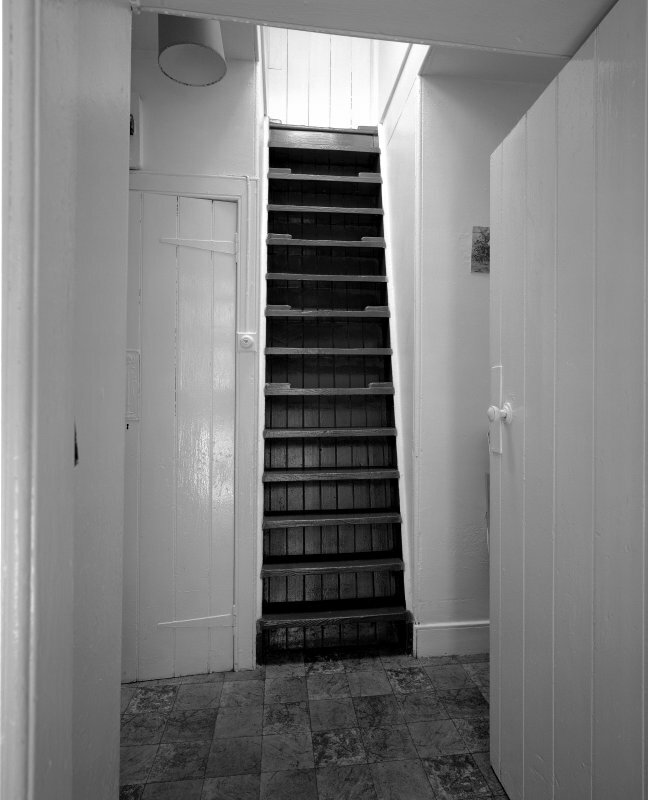 Interior view looking down stairs, 43 Magdalen Yard Road, The Vine, Dundee. 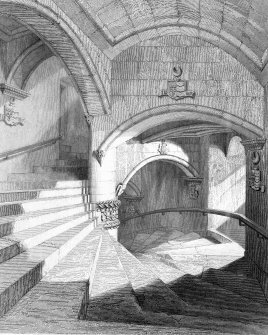 Drawing of public stair, 20-36 North Bridge, The Scotsman Buildings, Edinburgh. 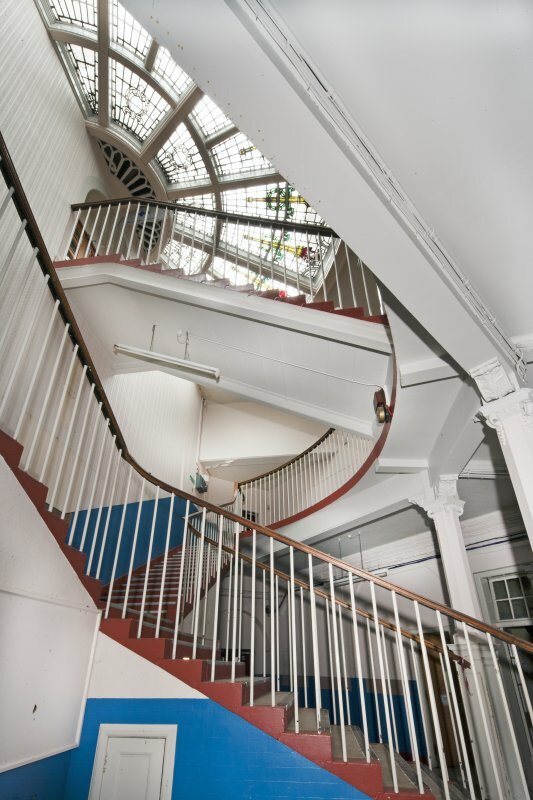 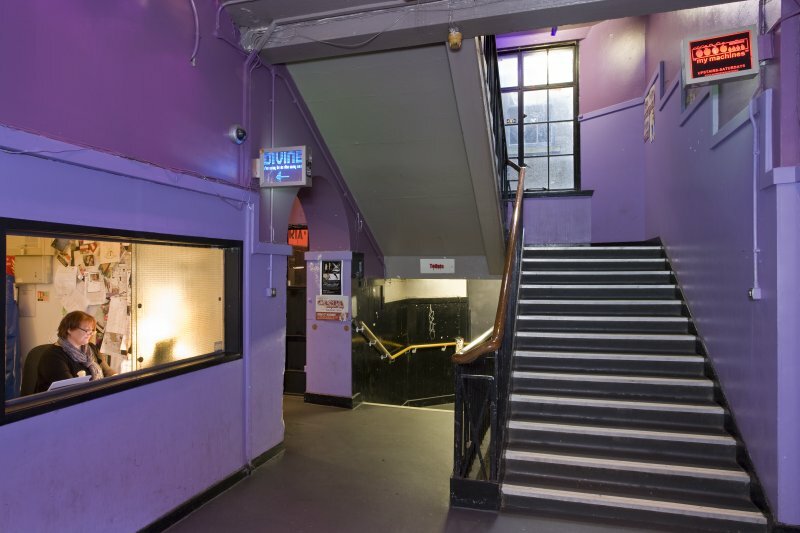 Interior view of main stair within the Foulis Building, Glasgow showing the top of the original stair and the 1990s extension. 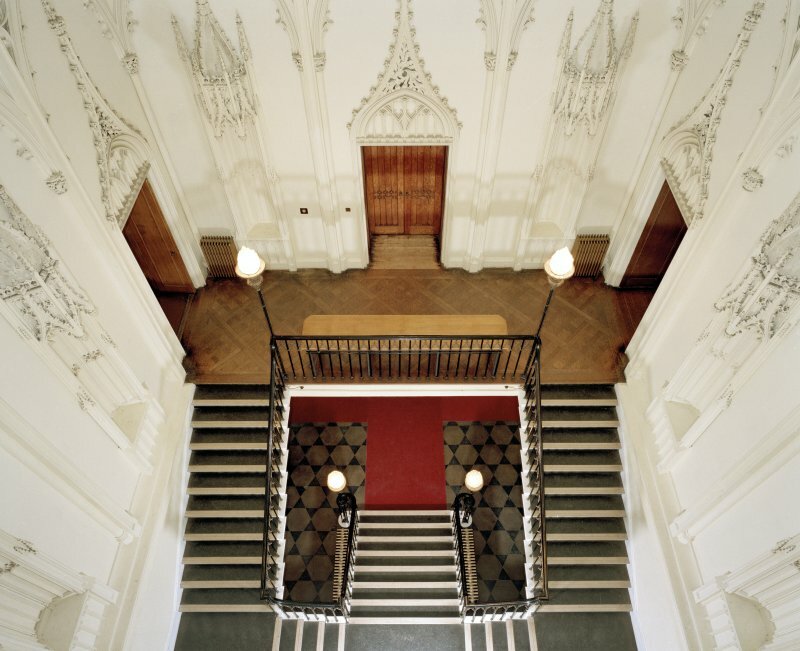 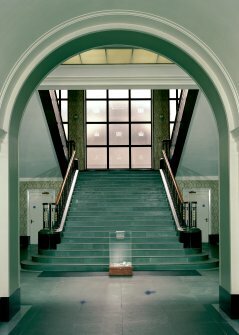 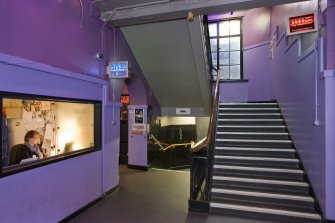 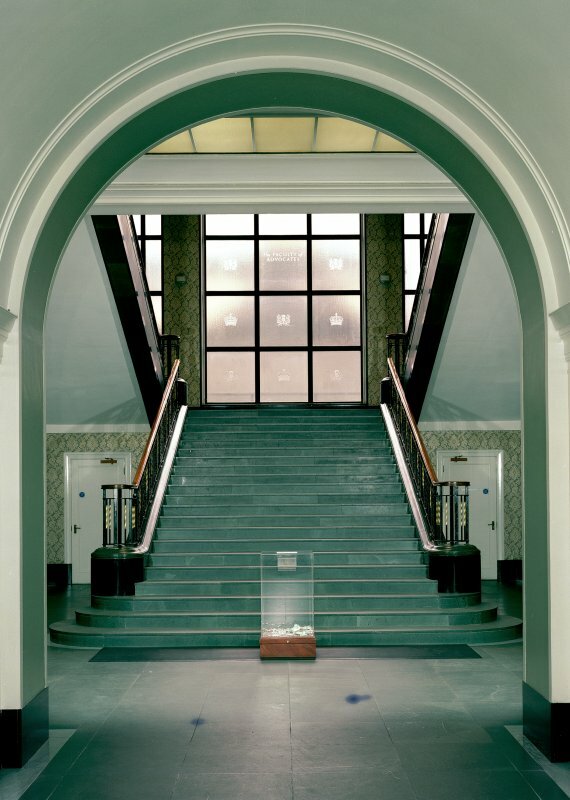 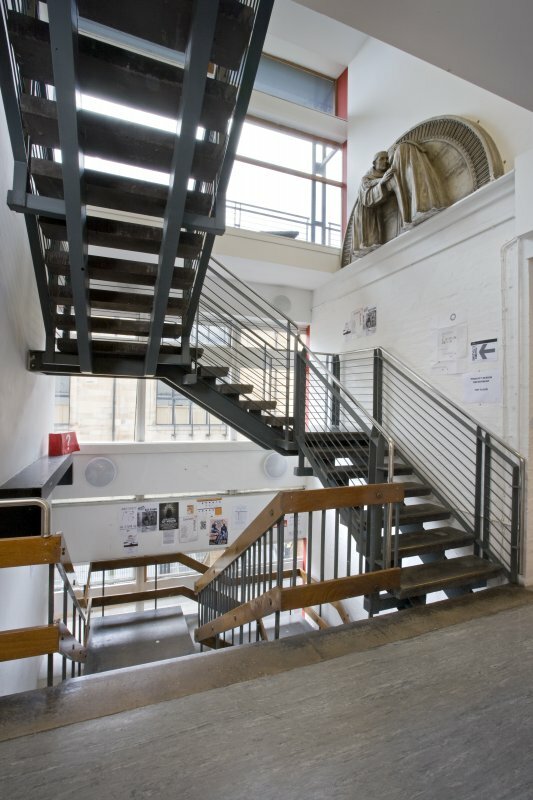 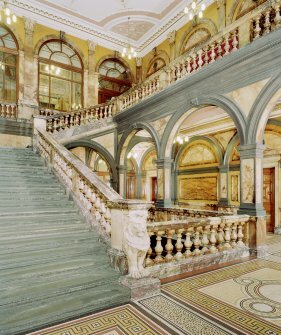 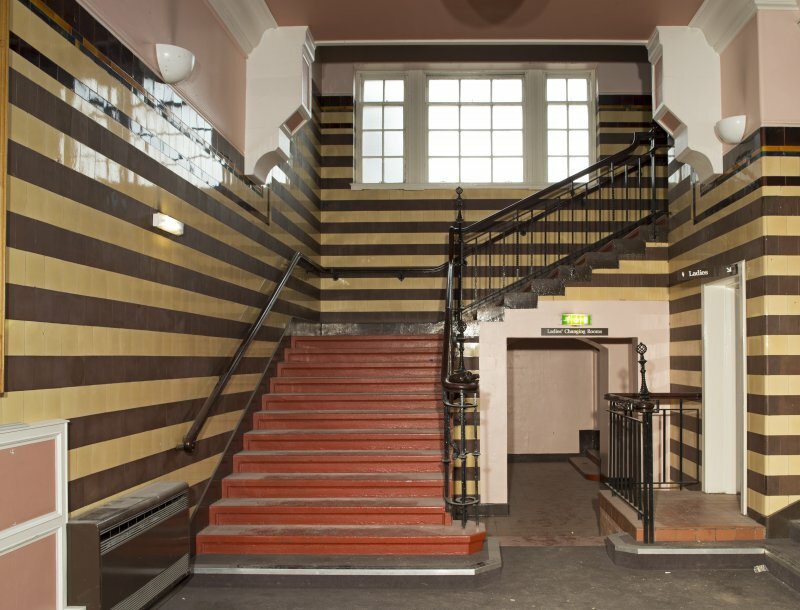 Interior view of reception and main stair within Glasgow School of Art Student Union building. 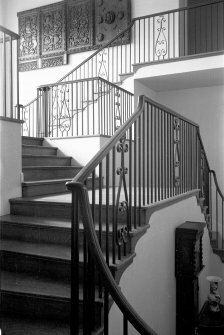 Interior view of ground floor stair hall with detail of newel and balusters on staircase, Brough Lodge, Fetlar. 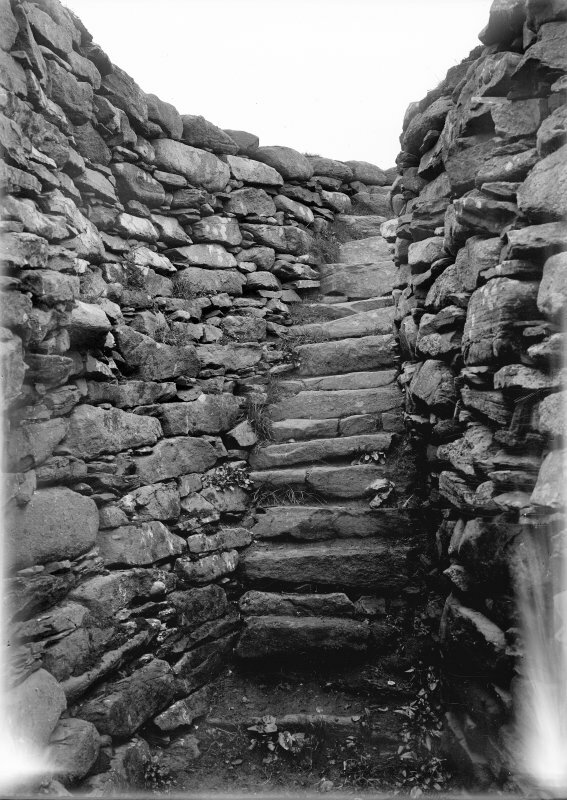 Interior view of ground stairs with detail of balusters on staircase, Brough Lodge, Fetlar. 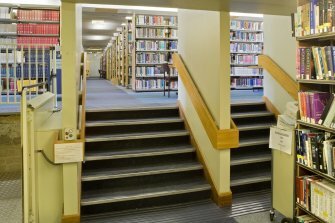 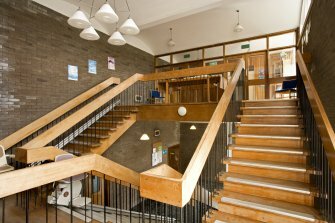 Interior view from second floor of the Queen Mother library, Aberdeen showing original phase of building looking up the stairs towards 1970's and 80's extensions. 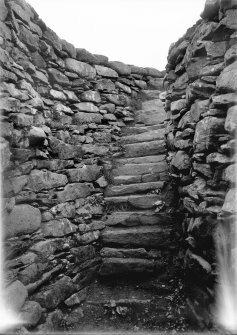 External detail of keep doorway and stair at Kiessimul Castle, Barra. 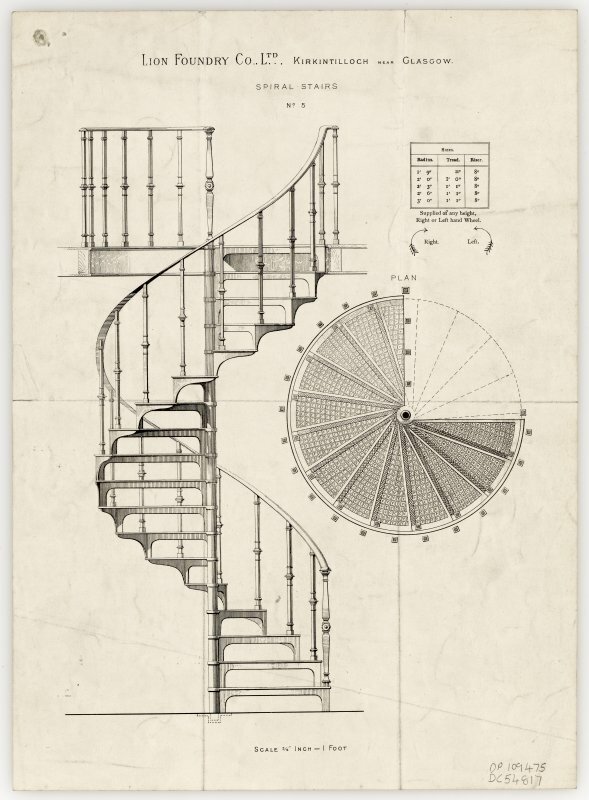 Lion Foundry Company catalogue excerpt showing design for metal spiral stairs, Number 5. 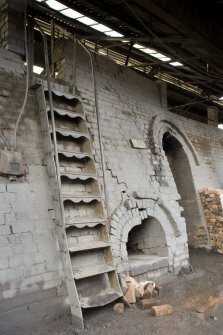 Detail of access ladder to Kiln No.1, Mayfield Brickworks. The style is reminiscent of omnibus tram stair tread design. 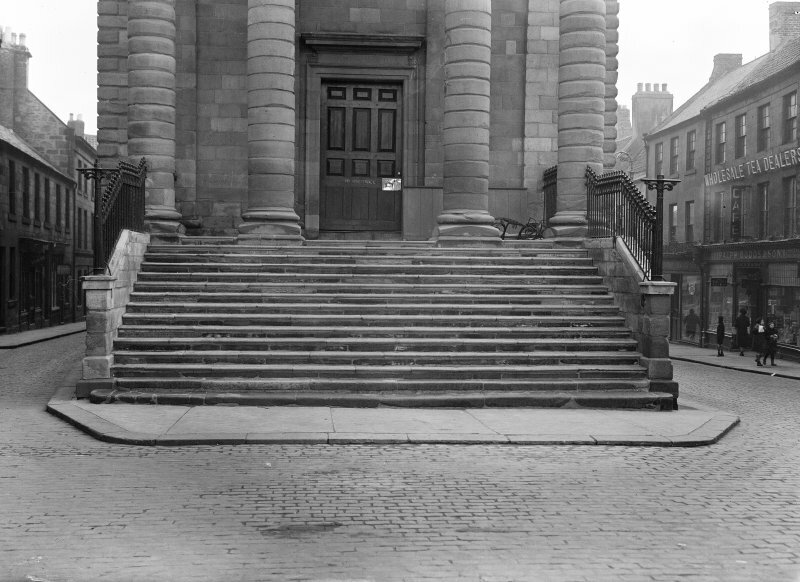 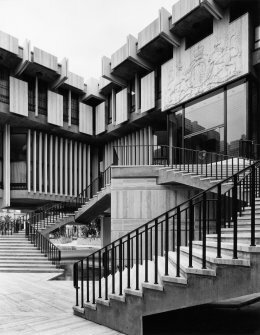 External view of entrance steps at Town Hall, Berwick-upon-Tweed. 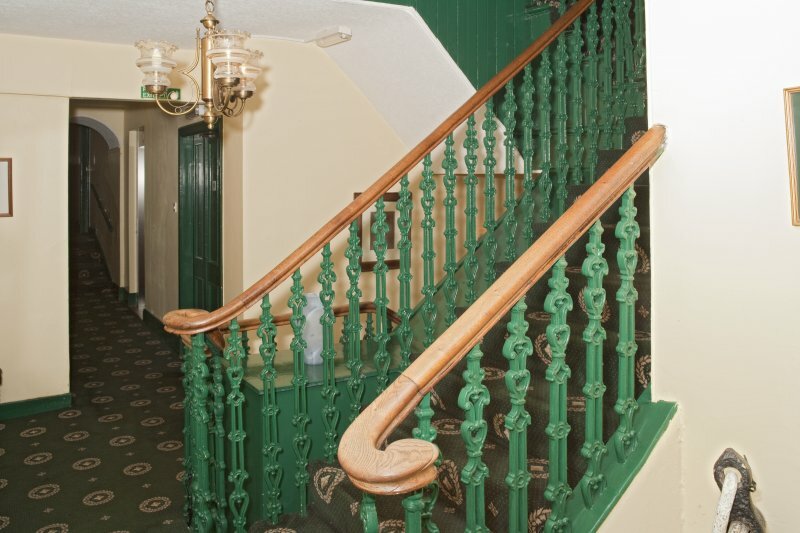 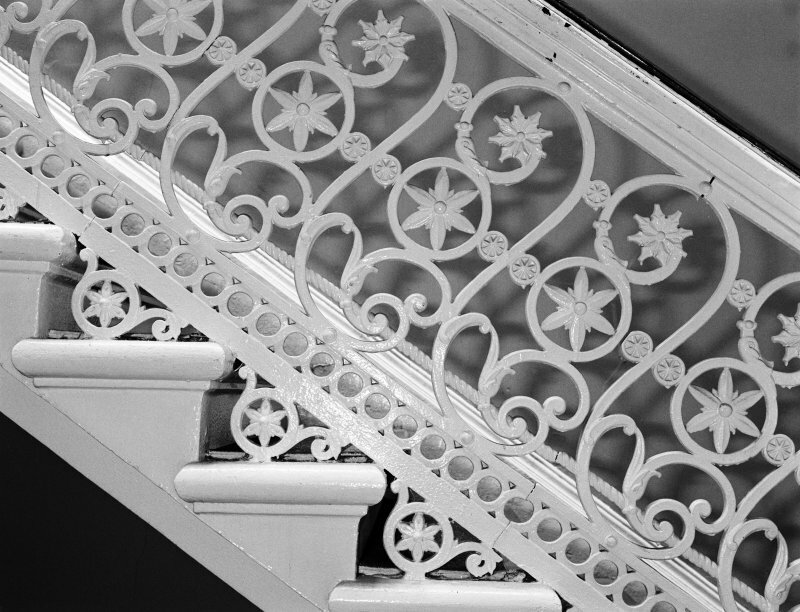 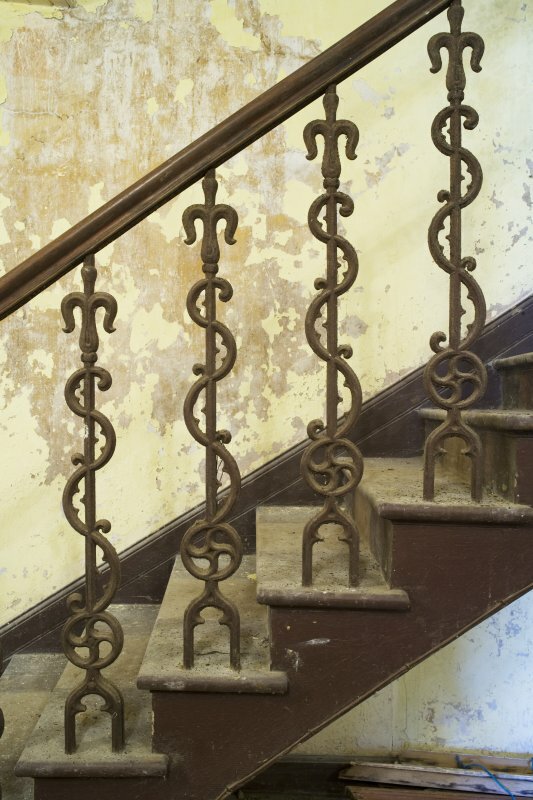 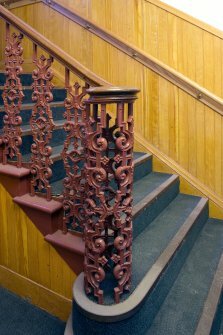 Interior view of the main stair showing ironwork balusters at Kenmore Hotel. Interior view of main stair linking platform and concourse levels of Kelvinhall subway station, Glasgow. 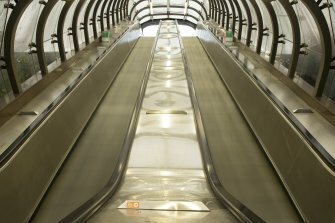 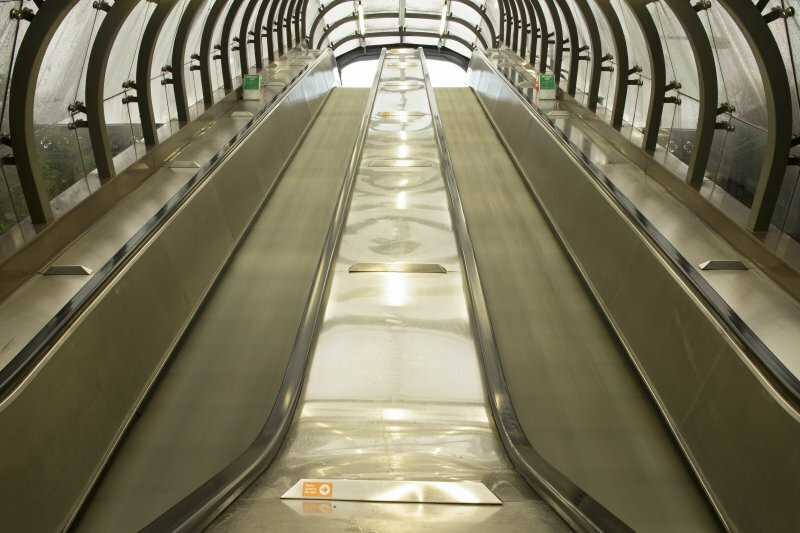 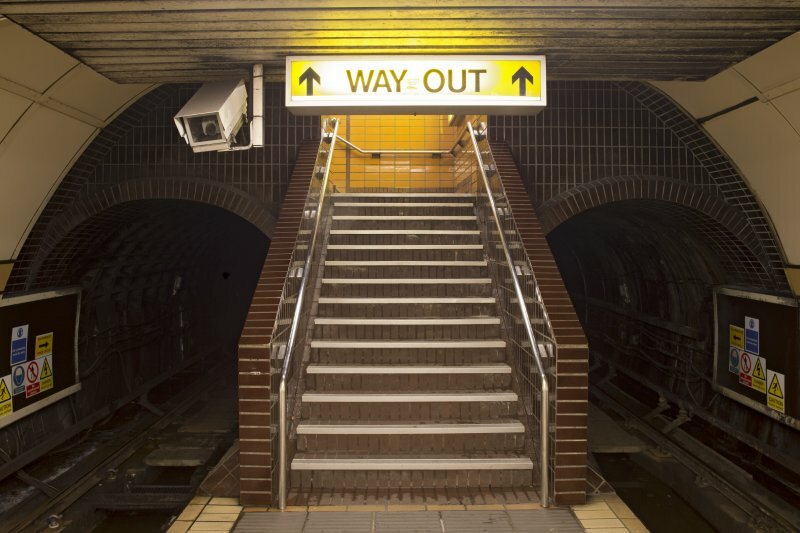 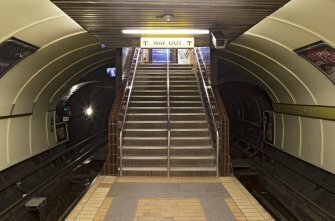 View looking up the escalator tunnel linking Kelvinbridge subway station to Great Western Road, Glasgow. 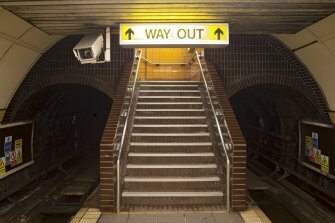 Platform level view of tunnel openings flanking main stair leading to concourse of St George’s Cross subway station, Glasgow. Interior view of ground floor main stair at Primrose Street Public Baths, Alloa. Interior view of balustrade, tiling and bracketing within the stair hall at Primrose Street Public Baths, Alloa. 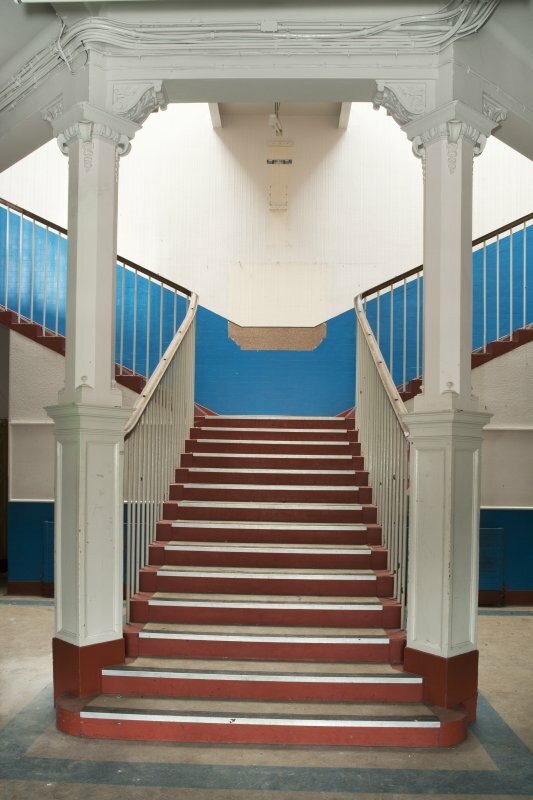 Interior view of staircase in the ground floor entrance hall at Craigie Hall, Rowan Road, Glasgow. 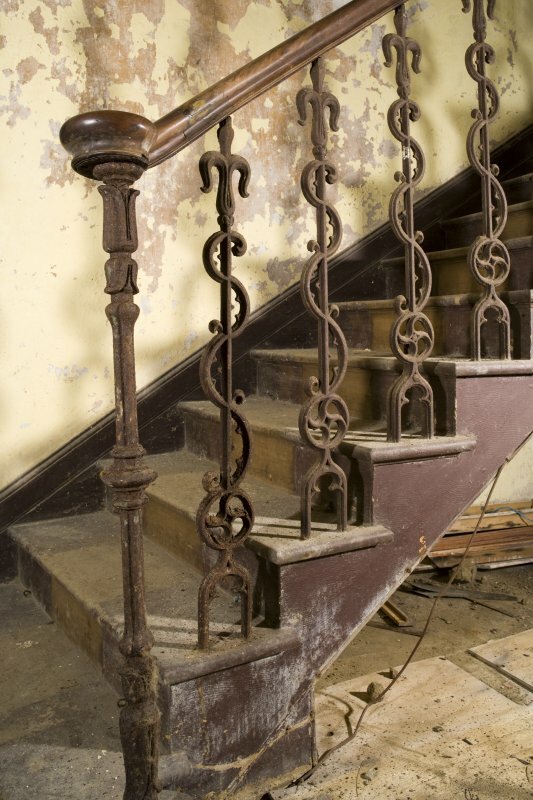 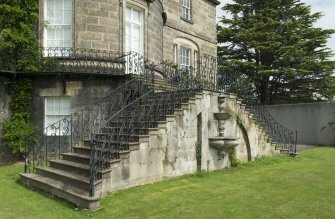 View of wrought iron garden stair railing at Hallyburton House. Exterior stair and fountain on south facade at Ravelston House, Edinburgh, view from south west. 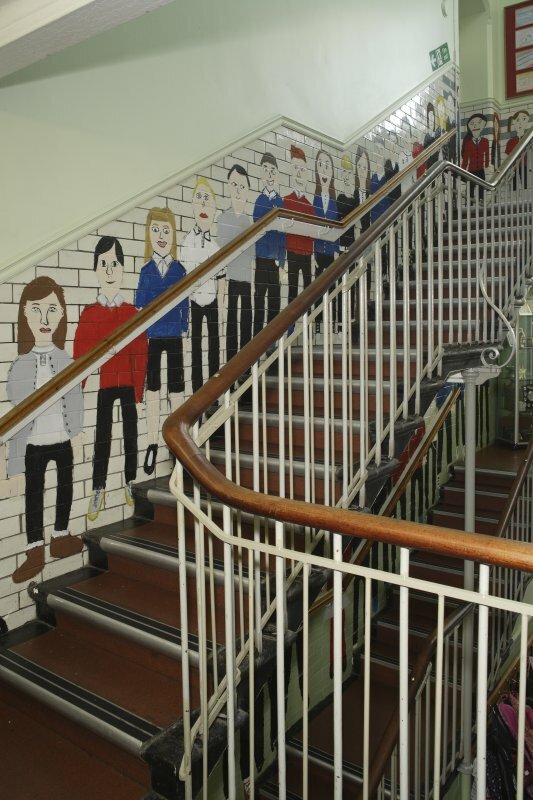 Interior view of west stair from first floor landing, Ferguson Building, Burntisland Primary School. 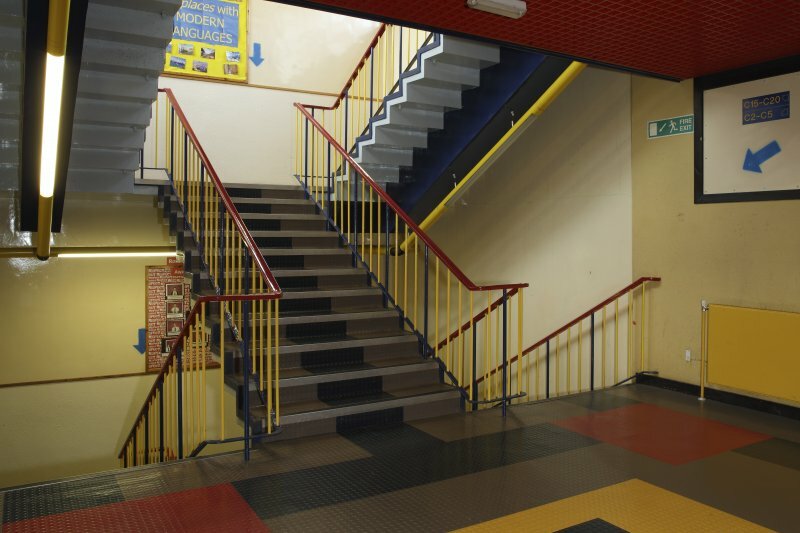 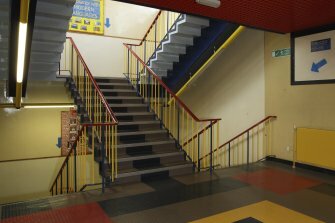 Interior view of C Block stairs at Kirkcaldy High School, Kirkcaldy. Interior views of staircases and chimneypiece for William Burrell Esq, Burrell's House, 8 Great Western Terace, Glasgow. 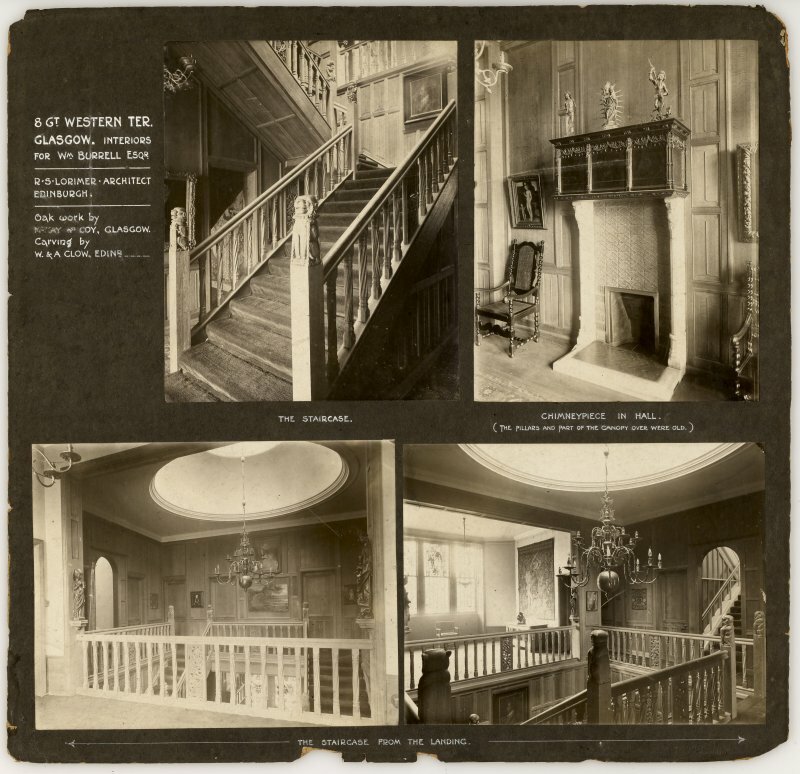 Four views showing foot of staircase, staircase from landing and chimneypiece in hall. 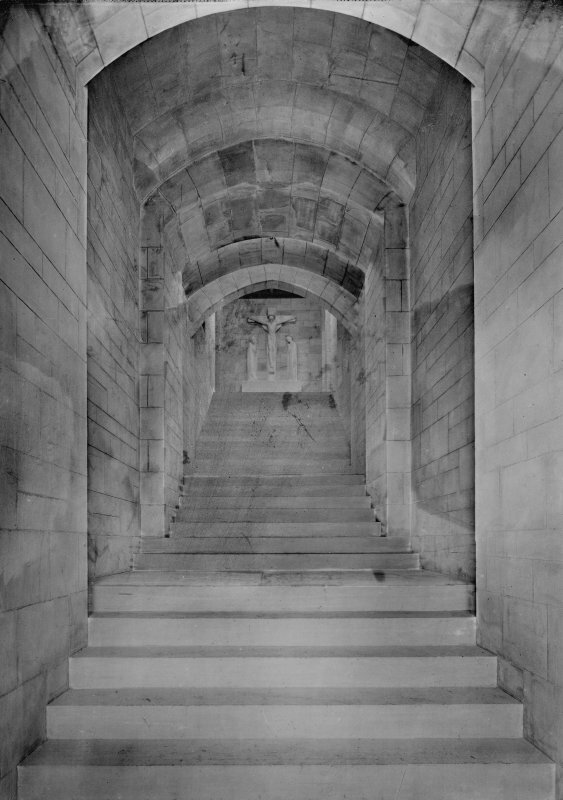 Interior view of stairs to crucifix, Old St Paul's Church, Edinburgh. Interior view of base of stair, Neidpath Castle. 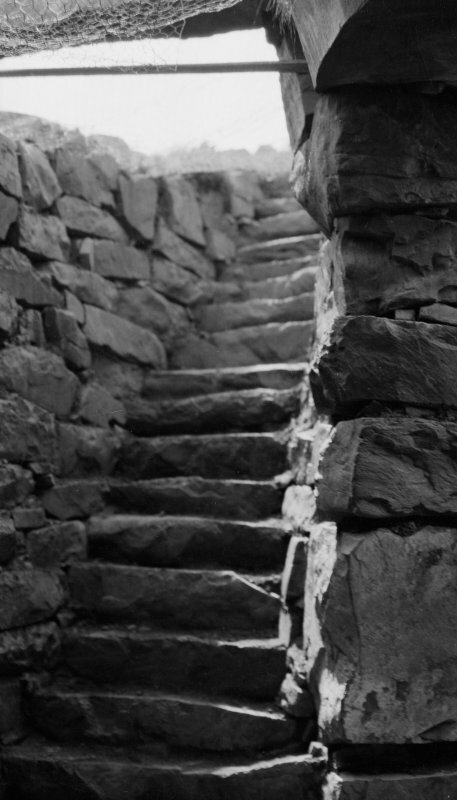 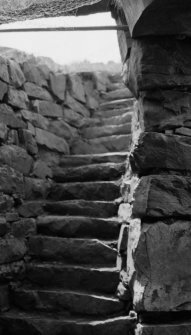 View of stairs at Dun Beag Broch, Struanmore, Isle of Skye. 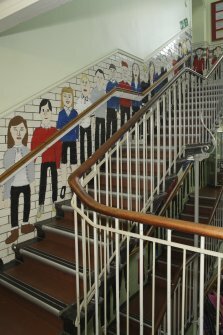 Interior view of stairwell in the east hall at Sir John Maxwell Primary School, Glasgow. 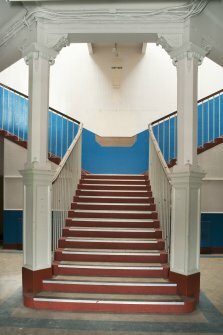 Interior view of main stairwell at Tynecastle High School, Edinburgh. Interior view of main stairwell and roof light at Tynecastle High School, Edinburgh. 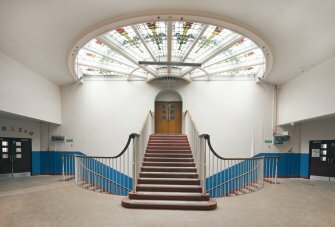 Interior view of main stairwell and roof light at the first floor level, Tynecastle High School, Edinburgh. 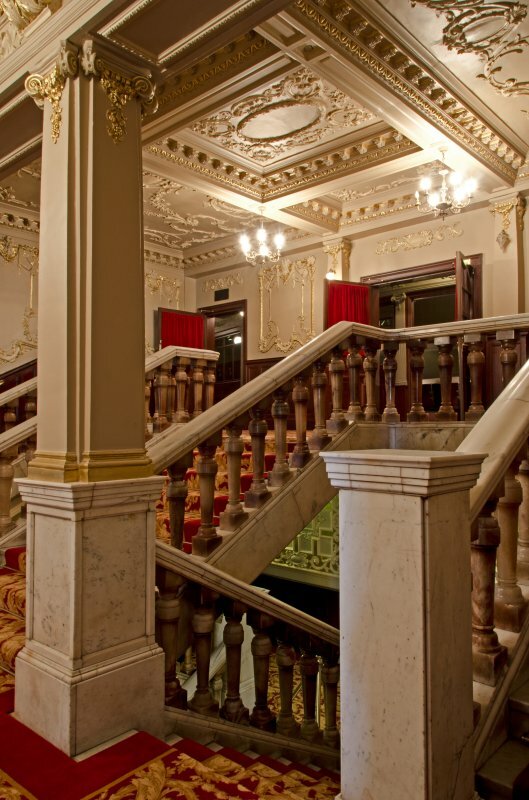 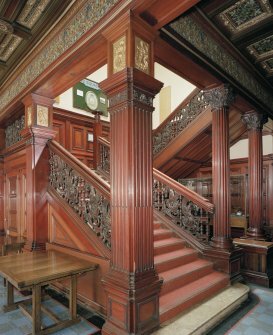 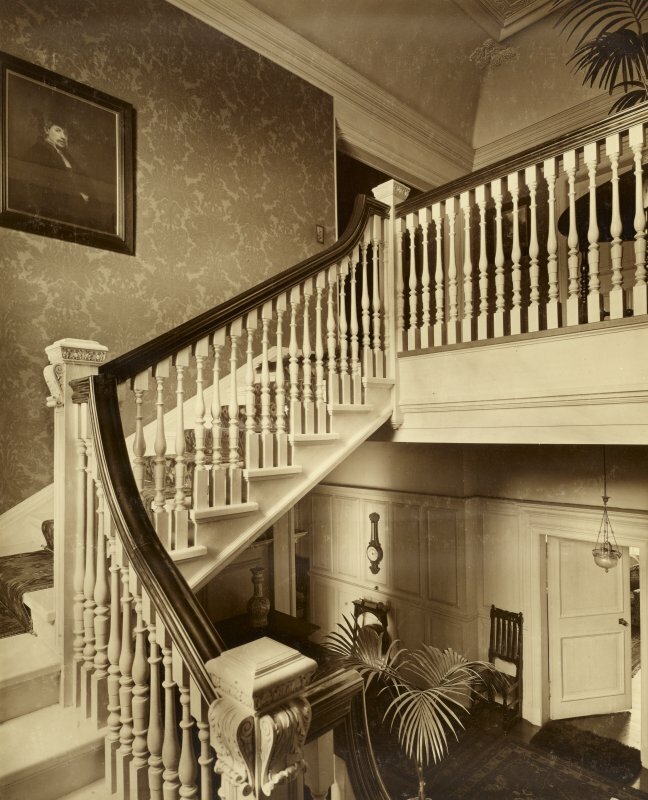 Interior view of staircase, Canaan Lodge, Edinburgh. Detail of balustrade on back stairs, Strathcona House, Aberdeen. 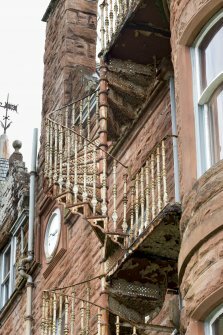 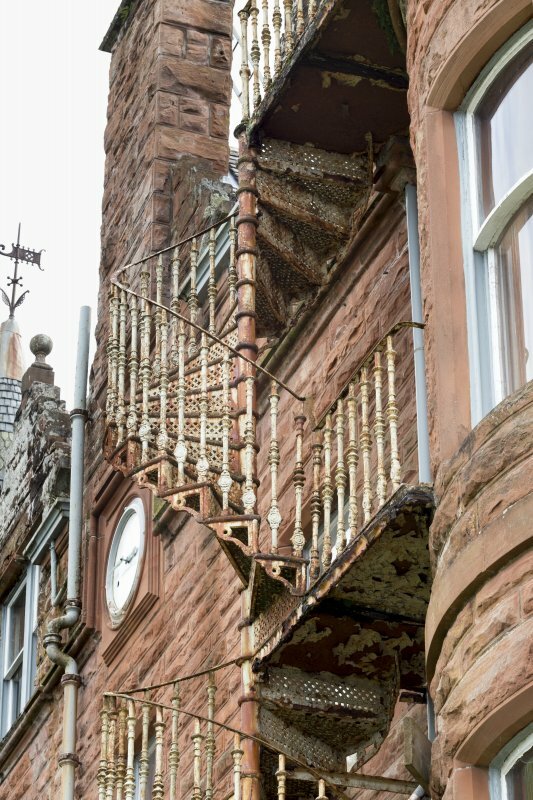 External view of cast iron spiral stair at Kilbowie House, Oban. 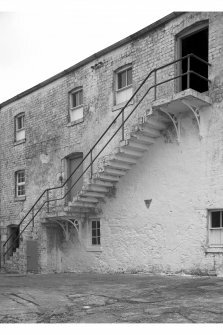 External view of north east corner of Cummins Engine factory, Shotts, comprising two steel-framed blocks (completed in 1980), and the end of a raised walkway (left) with emergency external spiral stair. 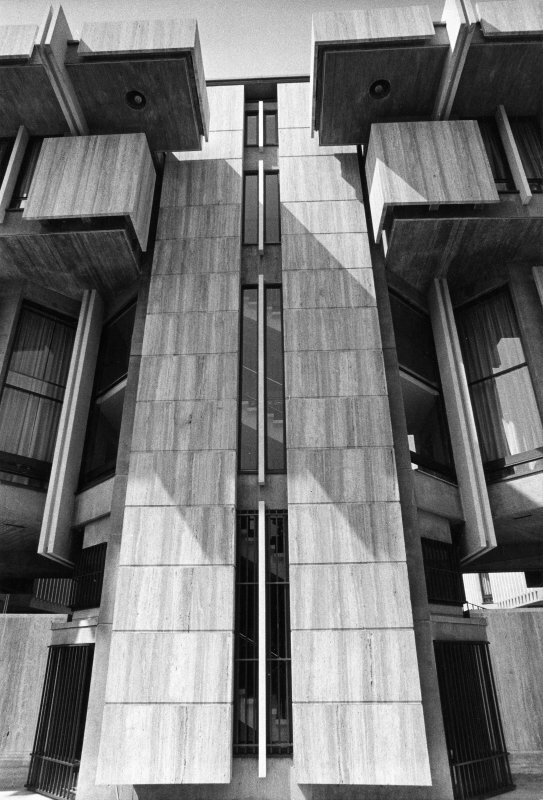 The more distant block (right) was the receiving area. 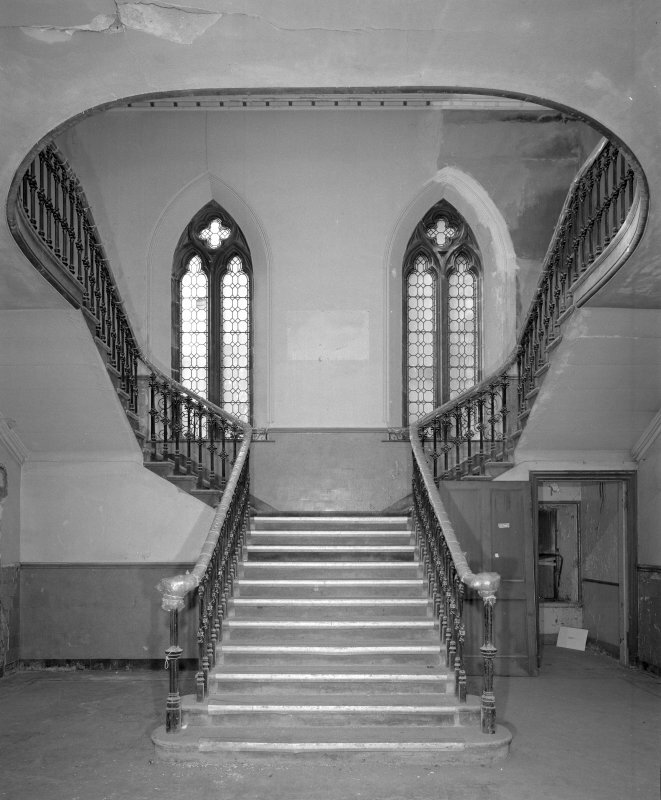 Interior view of west stair hall from east, Highland Church of Tolbooth St John's, Edinburgh. 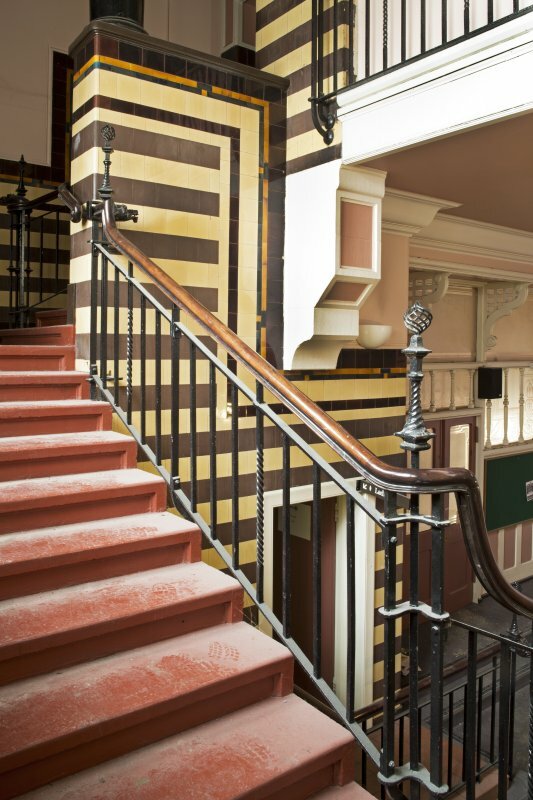 Detail of main stair balustrade and newel post, Sheriff Court House, Dornoch. 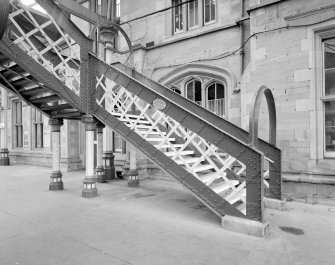 External view of platform 4 stair, Perth Railway Station. 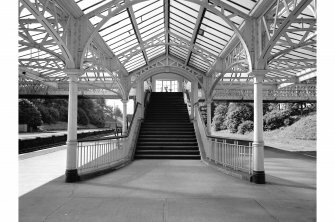 Detail of stair leading up to steel footbridge to Platform 3, built by Alex Findlay of Motherwell in 1893. 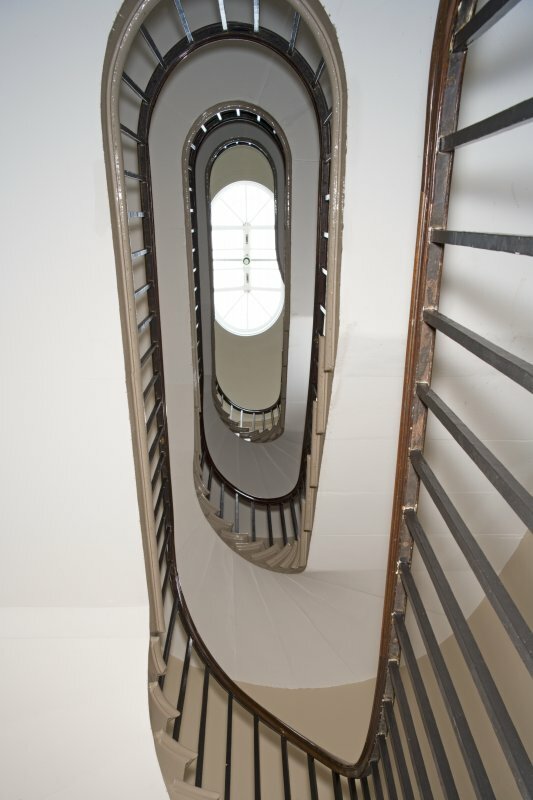 Interior view of stairwell from above, St Andrew's House, Edinburgh. 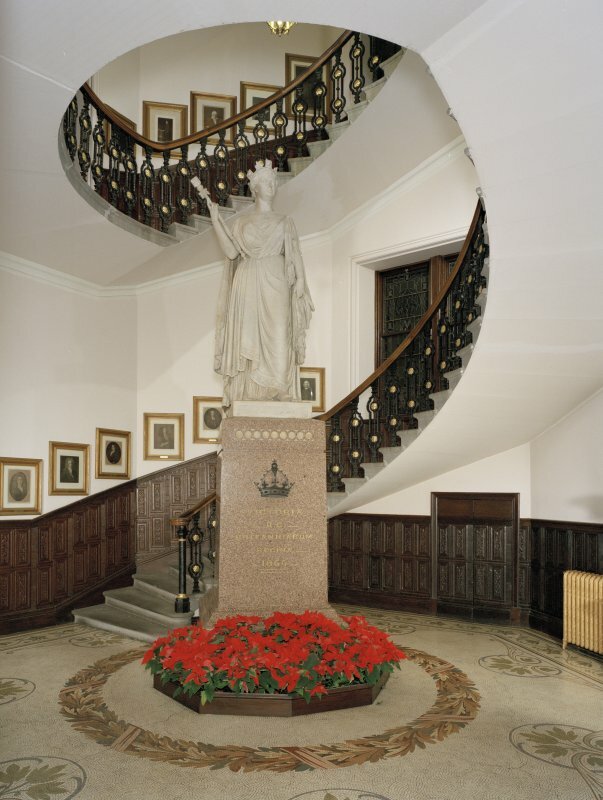 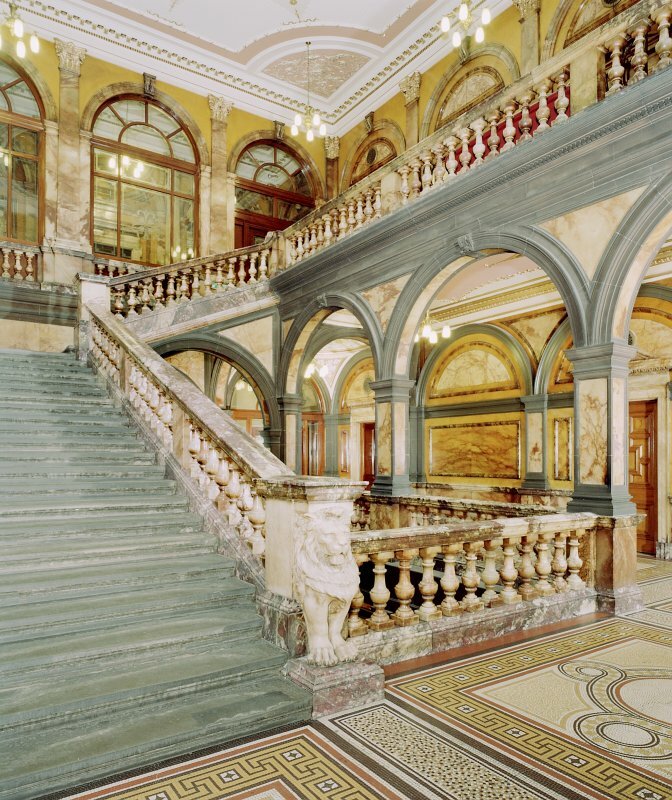 Interior view of town-house, ground floor, main stair hall and view of stair with statue of Queen Victoria at Aberdeen Municipal Buildings and Tolbooth. 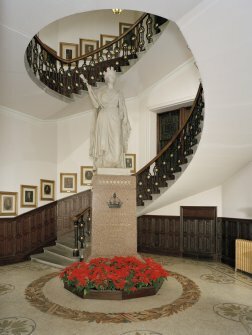 Interior view of town-house, ground floor and view of stair and statue of Queen Victoria from below at Aberdeen Municipal Buildings and Tolbooth.